This document describes progress on a library for procedural texture synthesis for use in evolutionary computation. 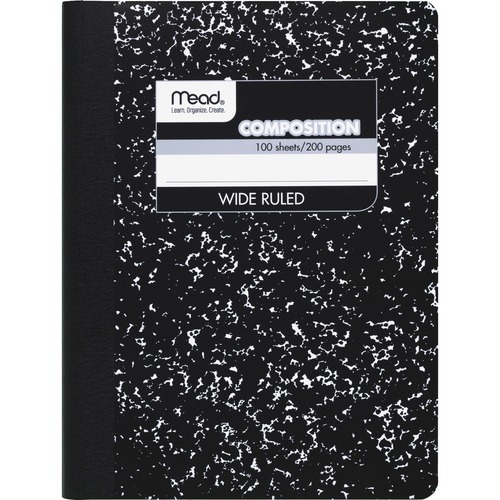 It is somewhere between a lab notebook and an informal diary. The entries are listed in “blog order” with the most recent material at the top. Or read from the bottom up beginning with an overview. 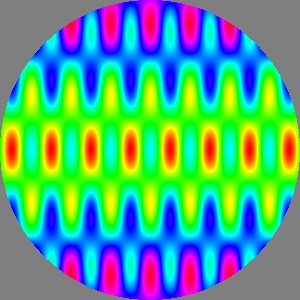 The sample images represent a unit diameter disk centered at the origin of 2d texture space, rendered at a resolution of 300 pixels. This library is part of a larger project in goal-based texture synthesis. It has been used as a component in a model of the evolution of camouflage in nature. 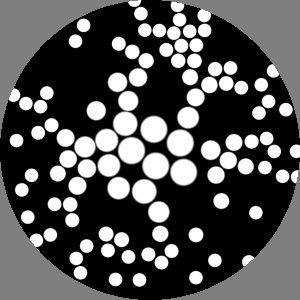 The round image shape is an artifact of that project, or can be seen as an homage to the space cookies from [Witkin & Kass 1991]. While this library can be used in the normal way by a human programmer (as in early samples below) it is primarily intended for use by an automatic programming technique called genetic programming. GP is a type of evolutionary computation related to the genetic algorithm. GA operates on bit strings while GP uses tree structured “genes” making it suitable for evolving expressions of nested functions, such as those in this library. This general approach is similar to Karl Sims' work on interactive evolution of textures [Sims 1991]. Sims used GP to evolve a function that computes a pixel's color from its coordinates. My approach differs slightly: evolved program do not reference pixel coordinates, they effectively return an entire texture. The functions in this library are divided into “generators” which produce texture given simple parameters, and “operators” which take one or more textures as inputs. Some timing information is given below but should be considered preliminary and useful only for relative comparisons. Probably at some point this will be rewritten to use GPGPU or multicore hardware. Fine print: the C++ code snippets below towards the top of this page, after October 16, 2009, were evolved with GP using Open Beagle, unless otherwise noted. Code before/below that date was hand-written. (Some having been lightly edited for readability. When code is shown as assignments, the value assigned to the variable texture is the displayed result.) Some of these diary entries have been revised after the date given, they are marked with “Update”. The most recent To Do list was posted December 1, 2009. Send comments or questions to Craig Reynolds. I have been doing further experiments with creating “random” textures using a fitness function as a high level description of the desired class of textures. Additonal description and examples are available on a new page tying together several of these recent experiments: goal-oriented texture synthesis. A paper describing these newer experiments will appear in the proceedings of evoMusArt 2011: Craig Reynolds. 2011. Evolving Textures from High Level Descriptions: Gray with an Accent Color. In C. Di Chio et al. (Eds. ): evoApplications 2011 (Applications of Evolutionary Computation). LNCS Springer. First of all, let me apologize to anyone who may have been checking in here, waiting for updates. It is not that the project has been inactive, just that the activity had moved elsewhere. Originally this diary was about procedural texture synthesis. Then the focus shifted to evolutionary procedural texture synthesis. Then last December the focus shifted again, and went underground. I was working on a novel application of evolutionary texture synthesis: modeling the evolution of camouflage patterns in the natural world. It was a tumultuous journey but my paper on that topic has been accepted by the Artificial Life XII conference to be held in Odense, Denmark in August 2010. 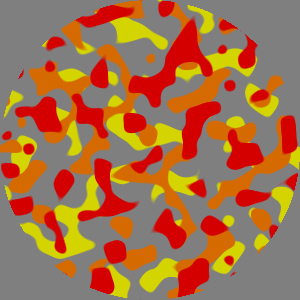 For more information see the paper's web page: Interactive Evolution of Camouflage. In some experiments using this library for texture evolution, I noticed red seems to appear more frequently than other colors. Cyan is also over represented, probably because it is easily derived from red. I think the primary source of this “too much red” symptom is the HueOnly operator (see March 23). 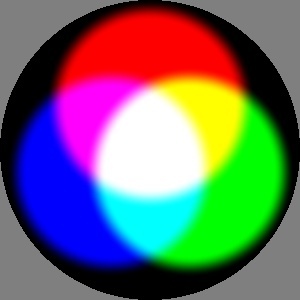 It uses the conversions between RGB and HSV color space to get the input's hue then returns the full saturation and full brightness color of that hue. But when the input is pure gray the RGB to HSV conversion defaults to a hue of zero, which maps to red. Any monochrome input to HueOnly produces a uniform red texture. This image is a “split screen” comparison of a monochrome sine wave grating processed by HueOnly (top half) and its new replacement called HueIfAny (bottom half). See code below. Future texture evolution will use HueIfAny instead of HueOnly. I chose to replace HueOnly rather than modify it because I want to maintain backwards compatibility in this library. I want old code, particularly quirky old code discovered by evolution, to continue to work as it did originally, even if that means preserving old buggy behavior. This allows old texture programs to be re-rendered if needed and used for metering and other comparison with subsequent work. HueIfAny is identical to HueOnly except that it returns unchanged any gray input pixels (those with zero saturation). As a result HueIfAny has discontinuous behavior for very, very desaturated colors as seen in this image and the code below. This is ColorNoise whose saturation has been reduced by a factor of two million. It is right at the edge of floating point precision. Most of the pixels have lost the ability to resolve minute differences between the RGB values. These gray pixels remain unchanged by HueIfAny. Some pixels still have one bit of color difference left. This seems to produce an effect like subtractive color mixing (see April 8) where primary colors are seen where blobs of secondary colors overlap. Another potential source of “too much red” is that several generators produce textures with many fully black or fully white pixels. These two values both happen to map to red in the BrightnessToHue operator (June 8). Again this is because red corresponds to hue values of zero and (since hue is cyclic) one. In this image a SoftEdgeSpot colorized by BrightnessToHue shows red in the white center and in the black exterior of the spot. To remove this potential bias toward red in BrightnessToHue I added a huePhase parameter to the operator's constructor. This is similar in effect to the AdjustHue (see July 17) operator and causes the set of hues to rotate by the given phase. 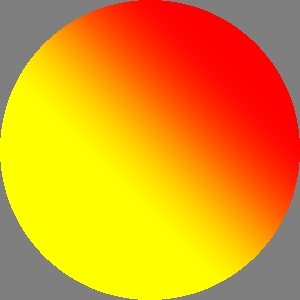 Here a value of 1/6 has caused the red parts of the previous image to become yellow and the other hues to shift accordingly. 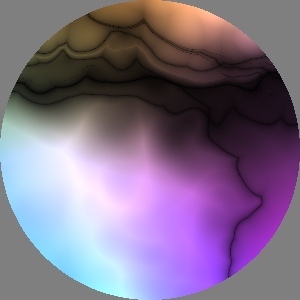 This parameter will now be part of the evolved texture program, meaning it will be initialized to a random value, and will be subject to adjustment by crossover and mutation. New texture evolution will use the new two argument constructor for BrightnessToHue while old code using the one argument version will continue to work as before. On May 15 and June 9 I prototyped “density slicing” operators that map from brightness to color. They seemed a bit awkward, and once I wrote Colorize (see July 4) it seemed like a better approach. I left the density slicing operators out of the function set used by genetic programming. Now I changed my mind and decided to make a new operator called BrightnessSlice4 and use it in GP texture evolution. 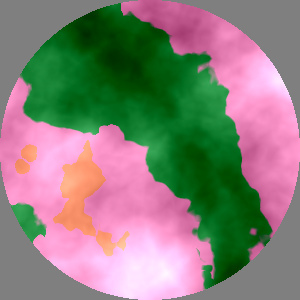 In this example, one Turbulence texture has been sliced into green, pink and orange regions, which is then multiplied(?) by another Turbulence texture. 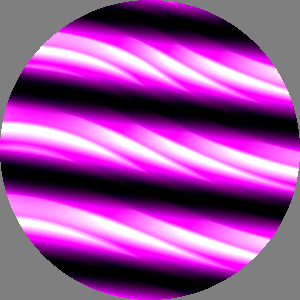 In this evolved texture, a Furbulence texture is apparently sliced into a pattern of white, pink, purple and green. That result is added to a NoiseDiffClip texture creating the lower frequency pattern of darks and lights. The new BrightnessSlice4 operator maps an input texture's brightness onto one of four given colors, based on three given brightness thresholds and a softness parameter that controls the width of the three transitions between the four colors. This image is made with hand written sample code below. 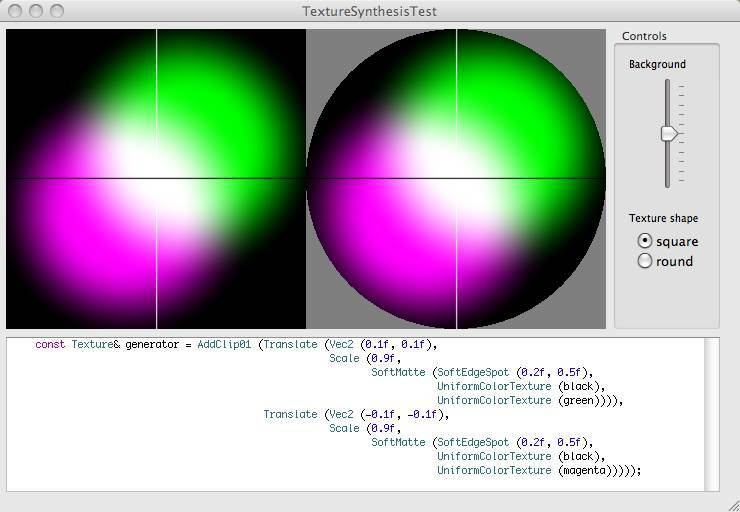 I added GP interfaces for recent texture synthesis operators. 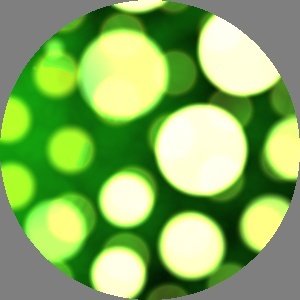 This texture uses several layers of SpotsInCircle in yellow and white over green. It looked to me a bit like an out of focus photo of lights at night. As with earlier evolved texture tests, today's images use GrayTheHardWay (see Oct 23 etc.) as the fitness function. As mentioned before, I sometimes include an ad hoc bias in fitness to encourage the use of specific texture synthesis operators to help test them. I did that for SpotsInCircle above, then changed the bias to look for an example of NoiseDiffClip. Instead I got this lovely image featuring SpotsInCircle. 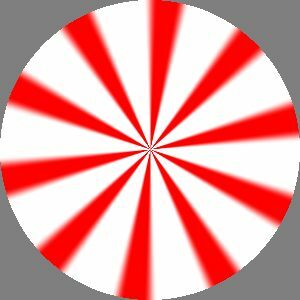 In the “foreground” there are small black spots, many of which seem to have smaller red spots inside them. Possibly one is a mutated copy of the other, differing only in the maxRadius parameter? 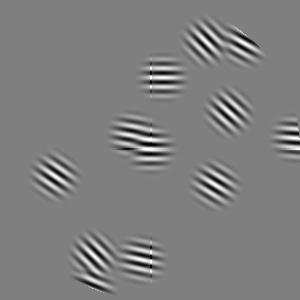 The larger bluish spots show a strong variation in size presumably based on SpotsInCircle's sizeMap parameter. Eventually I found this evolved texture making conspicuous use of NoiseDiffClip. In fact this 128-node program has 13 calls to NoiseDiffClip! 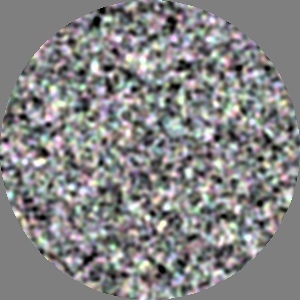 In addition to the visually dominate one (reddish mid-tones and a scale similar to the first image on Feb. 6) the high frequency yellow and blue speckles are probably also generated by NoiseDiffClip. 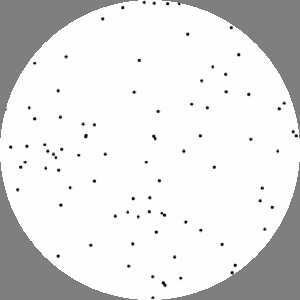 The July 26 LotsOfSpots post speculated that another texture could provide a color for each spot. This new ColoredSpotsInCircle operator provides that functionality, with the same provisional status as SpotsInCircle: I would like to eventually replace this with a “space filling” version (see yesterday's post). The texture shown here uses the same five parameters as the top image yesterday. A sixth parameter, the ColorNoise texture shown in the second image, provides the spot's colors. 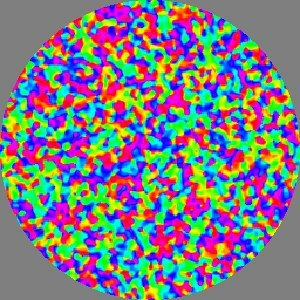 Not yet implemented: a similar LotsOfSpots-like operator that takes a third texture parameter and maps a disk of it into each spot. This ColorNoise texture determines the colors of the spots above. 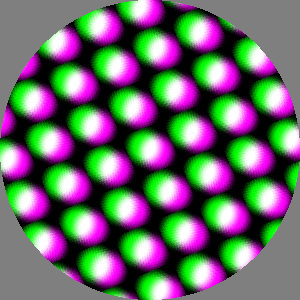 Each spot looks at the color in this texture corresponding to the spot's center. Some “drift” of these look-ups (for color, size and likelihood) may occur due to the adjustment of spot position to avoid overlap. I updated the LotsOfSpots prototype from July 26 but was concerned about the way the spot centers were restricted to the unit circle around the origin (the part shown in these renderings). 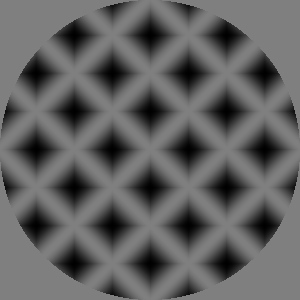 Scaling down or translating LotsOfSpots reveals a circle containing spots and empty black outside of that. Ideally I would prefer an unbounded, space filling pattern. This might use an approach like the grid-based random seeding described in the paper [Lagae et al. 2009] about sparse Gabor convolution, mentioned here last May 9. I decided to side-step this limitation with a name change. 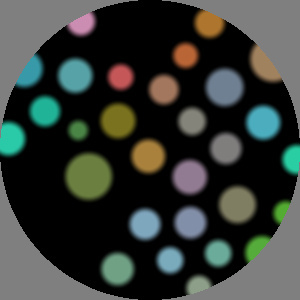 Eventually there may be a space filling version of LotsOfSpots, but for now this interim operator will be called SpotsInCircle. 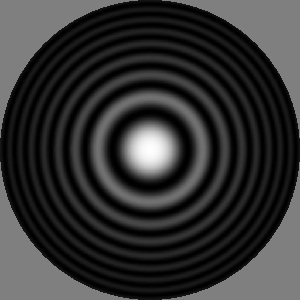 In the top image, spots are distributed uniformly within the unit circle, their radii are proportional to a Noise texture. 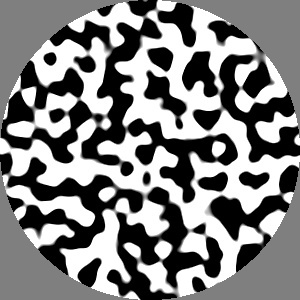 In this example both the likelihood of a spot appearing, and the relative size of each spot, vary over the image. They are controlled by the two input textures. 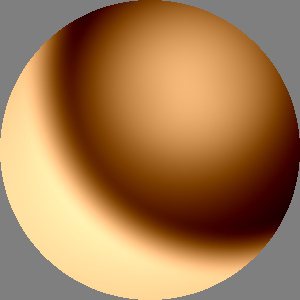 In this case the relative size varies horizontally across the texture: largest in the center and down to zero at the left and right sides. 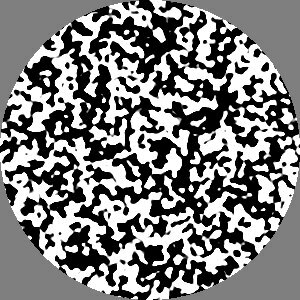 The likelihood of a spot appearing varies vertically: high near the center and low at the top and bottom of the image. I plan to let GP choose maximum spot radius on the range [0, 1]. 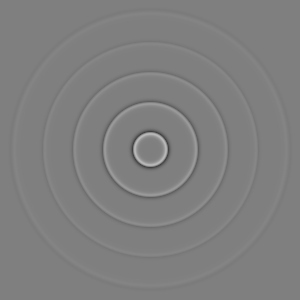 This is what it looks like when 20 spots of radius 0.5 try to fit inside a circle of the same size. 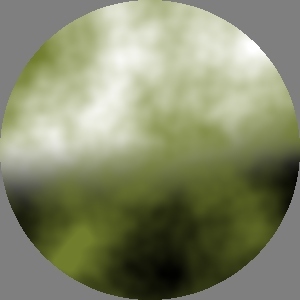 No evolved textures today, this is about a new generator for the texture synthesis library. 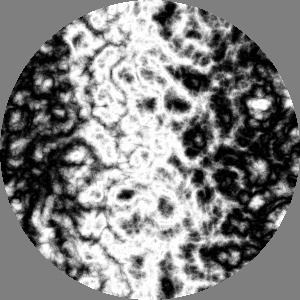 Originally inspired by the third image on July 19, this labyrinth-like texture is similar to applying a soft threshold to Noise. The implementation used here produces a more organic shape by clipping the difference between two Noise patterns, offset in position and rotation. The parameters for this new NoiseDiffClip generator include a scale and position (like Noise) plus a softness value between 0 and 1. Softness is 0.05 in this first texture. Another NoiseDiffClip with a softness of 0.8 and 2/3 the scale. This has a different style than basic Noise, compare this image to those on May 4. Looking at brightness histograms, this texture has more pixels in the midrange and fewer at the bright and dark ends of the scale. During December I experimented with new kinds of fitness and population replacement strategies for GP in Open Beagle. 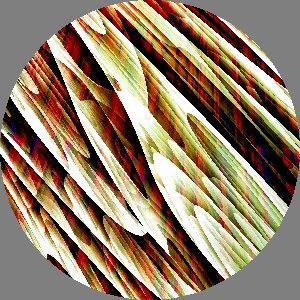 Novel textures are created as a side effect of this testing. I collected some of the interesting ones, but neglected to post them until now. Looking down into a container as gloppy green liquid is poured in -- or something like that. Woodgrain-ish texture from Stretch, Wrapulence and others. “Polar blurs” along constant angle or radius (related to September 11, 2009). LotsOfSpots, as prototyped on July 26, 2009. 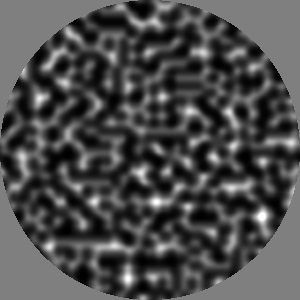 Generator based on the “Max of Noise” labyrinth, see third image on July 19, 2009. This marks having completed a pass over the entire library of texture generators and operators, connecting them to the GP engine of Open Beagle. It is also just about a year since I started working on this project in earnest. Other candidates for the library exist only as prototypes or unimplemented ideas. I will list those in an updated To Do list then relegate them to the back burner while moving to the next phase of this project. Things may get quiet here for a while. 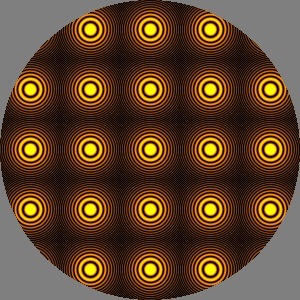 This texture uses ExpAbsDiff with several Multiplies, noise generators and SoftEdgeSpots. In all of today's examples the fitness function is biased toward inclusion of ExpAbsDiff and the grating generators were excluded. 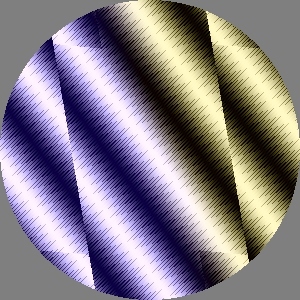 (I'd gotten tired of all those stripy patterns favored by GrayTheHardWay.) 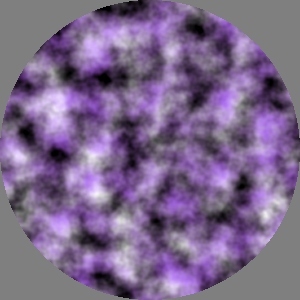 As a result today's textures are primarily based on the various noise generators. This texture's evolved program consists of these operators: ExpAbsDiff, Multiply, HueOnly, Wrapulence and ColorNoise. The red “background” looks to me like the ExpAbsDiff of noise and a constant value. It is a bit like the textures in the September 12, 2009 post, which makes sense since ExpAbsDiff is a generalization of the DifferenceSquared operator prototyped there. I rescued this very cool texture from a run that crashed. I ran into the same problem using the Gamma operator with GP. The exponentiation is well behaved for pixel values in the normal [0,1] range but produces NaNs for negative values and can produce INFs for large values. In both cases I took the simple, if heavy-handed, approach of clipping each pixel's RGB values to the positive unit cube before exponentiation. This texture was the best of run at generation 42 with a fitness of 0.83 when it hit the error. 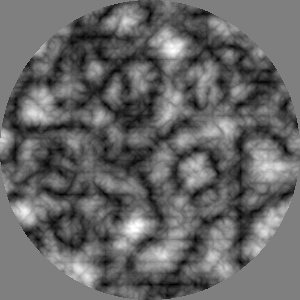 The second parameter to the outermost ExpAbsDiff (see code below) produces the mottled pattern (it looks a bit like the “composition book cover” of Mar. 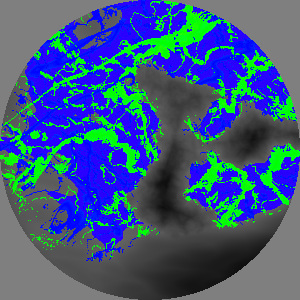 28), and the third parameter is just a gradation from green to to cyan to dark blue. From those elements the ExpAbsDiff produces this '60s Fillmore poster color style. The good news is that I extended the GP function set to include the three texture operators based on Gaussian filters: Blur (Aug. 14), EdgeDetect and EdgeEnhance (Aug. 24). The bad news is that these operators are an order of magnitude or two slower than most of the other operators. (Fractal noise is the next slowest type, roughly 10 times faster.) They result in very slow GP runs, hours instead of minutes. While I did my best to find some evolved textures featuring these operators, I may leave them out of future runs. The other good news is that I noticed I had broken my recent fix to the memory leak, now replugged and stress tested. I found and fixed an unrelated leak in EdgeEnhance. Here an EdgeEnhance modifies Furbulence, inside a Twist, producing the arc-shaped green streaks. Perhaps the high frequency “ringing” along those streaks correspond to the Gaussian kernel size (0.02 ≈ 6 pixels)? As mentioned on August 19, I added a hack to the 1d utility GaussianBlurX to basically ignore filter sizes greater than 0.25 by simply returning the average pixel value of the input texture (as if the filter size was infinite). The goal was to prevent evolution from supplying a huge filter size that would take much too long to compute. Upon reflection I decided I did not like that approach and removed it. 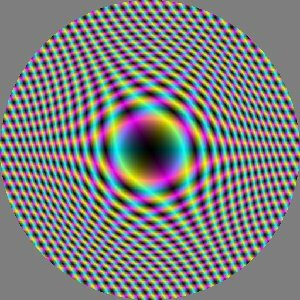 The source code might suggest that a Blur was being computed with a filter size of 0.5, but it would be silently reinterpreted. If this invisible max size parameter was ever changed, old programs would produce different results. Instead I added yet another kind of GP ephemeral constant for specifying the size of Gaussian kernels. I limit the range of values it can take during evolution (currently [0.011, 0.05]) rather than make ad hoc adjustments once a too-large value is passed into the operator. I added Mirror (July 18) plus Max and Min (July 19) to the GP function set. I was having a hard time finding a test GP run that illustrated these operators. So in addition to biasing fitness toward these three operators, I also removed the grating generators and got more interesting results. 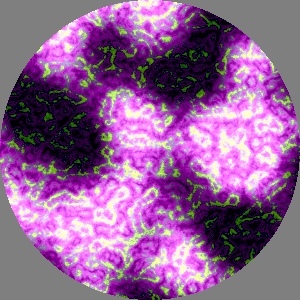 This very cool pattern reminded me a bit of “Bozo's donut” from [Perlin 1985]. 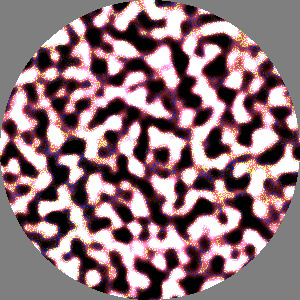 The blobby transparent white shape is probably Max acting as a threshold on Noise. (Something like blobs in my August 24 post.) The background is ColorNoise. The wispy curved pattern must be formed by the 6 calls to Twist in the large (size 287) evolved program. It also includes 12 calls to Mirror (of which I can see no visible evidence) and 16 calls to Max. This texture also contains calls to Mirror that produce no apparent result. 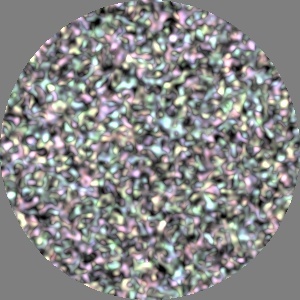 Min is used to threshold the dark gray noise texture into the blue, green and purple patterns. This is the only example I saw where the effect of Mirror is obvious. There is a roughly vertical line of reflection passing very close to the origin (see the outermost call to Mirror in the evolved code below). There are two other fold lines arranged symmetrically to the right and left of the main fold. So I suspect we are seeing the result of two nested calls to Mirror. The program actually contains four calls to Mirror, three have identical angles and three have identical centers. 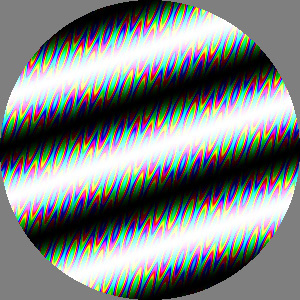 Those curved black “lines” appear to be level sets of the Noise function. I added Gamma (July 7), AdjustSaturation (July 16) and AdjustHue (July 17) to the set of functions used by GP to evolve textures. The texture to the left uses AdjustSaturation and the curvy edges come from Wrapulence which was added to the set yesterday. 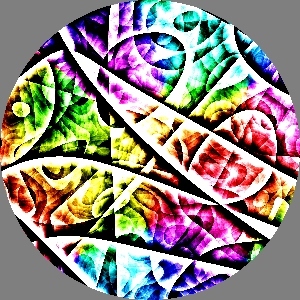 This evolved texture combines some triangle and sine gratings with AdjustSaturation, VortexSpot and BrightnessWrap. This has an interesting look, as if it were a cut paper construction (see) with lots of little paper flaps each casting a soft shadow. The irregularity of the grid is also cool. Note in the code below that inside the Gamma there is an Array of the product of VortexSpot and Twist. 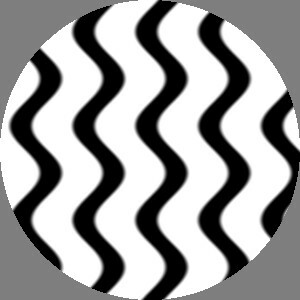 The VortexSpot operates on another Array of a TriangleWaveGrating. // coc20091124e -- yellow "cut paper construction"
The July 4 entry describes defining 1d textures as the y=0 “slice” of a 2d texture. It shows examples of using these 1d textures to construct gratings, radial patterns, nonlinear shears and colorizations. I connected these operators (SliceGrating, SliceToRadial, SliceShear and Colorize) to the GP function set after adding a missing angle parameter to SliceGrating and a center parameter to SliceToRadial. I also belatedly added the Wrapulence generator to the GP function set. 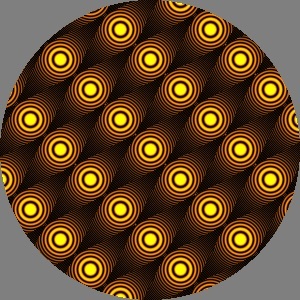 This first image shows a spoked pattern based on SliceToRadial. It is a little hard to tell by looking at the huge evolved program (size 329) but this seems to be a SliceShear applied to ColorNoise, perhaps using Noise as the shearing profile. It is hard for me not to interpret this as a 3d rendering of textured surface with a soft highlight -- like a molded plastic surface, or quilted textured satin. It seems to be mostly the product of several TriangleWaveGrating, see code below. The role of the SliceShear is hard to fathom but may provide the high frequency detail overlaid on the lozenge pattern. The top two textures feature the Array operator (Apr. 26) evolved, like other recent results, with GrayTheHardWay and a bias for including a given operator in the genetic program. This first image has a nice “pen and ink” style of “shading”. Here I again used a bias to include a call to Array but only a single call was allowed. That led to this simple parallelogram tiling of texture space. 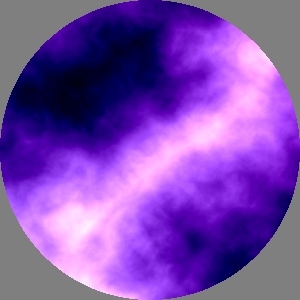 This texture shows the effect of a call to BrightnessToHue (June 8). Evolving programs with this operator also found another bug in the RGB↔HSV conversion routines related to hue wrap around. The large swirls come from VortexSpot, the scratchy patterns on top of it are apparently the result of BrightnessWrap. Karl Sims noted that evolutionary computation is very good at finding bugs. I have certainly been having that experience. One of my first runs with BrightnessWrap showed that it failed when the two brightness thresholds are equal (leading to a division by zero and NaN). Not the sort of thing a human programmer would ever do, but evolved programs don't know what makes sense and what does not. I also added a new constructor called Gray based on Pixel::gray which (unlike the existing Pixel constructor) permits values larger than 1, allowing Tint to scale up brightness. 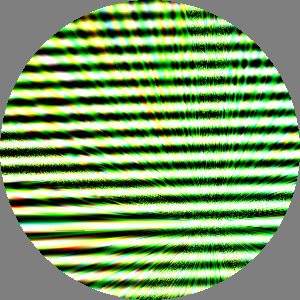 Note that at least for the time being I decided to leave these texture operators out of the GP function set: ExperimentalRandomStamper (too slow for now); ExperimentalDensitySlicer, DensitySliceTenRamps and DensitySliceTenSteps (replaced by Colorize) CacheTest and ExperimentalTextureToWaveform (intended only for testing). I continue to work through the library of texture synthesis operators, cleaning up and interfacing them to genetic programming plus watching the test GP runs for cool results. I continue to use the fitness bias to test each new operator. This texture shows SoftThreshold (Mar. 28) applied to Furbulence (May 18) noise. Indeed it appears to be “sliced off” with a bright top, a dark bottom, and fractal swirls in between. This lovely pattern is based on Twist (Apr. 3). I first assumed it also used Row but that operator does not appear in its genetic program (below). In fact the “rows” seem to be subtly different. This texture clearly shows its nested calls to VortexSpot (Apr. 3) operating on a tinted SineGrating. Adding new operators to the GP function set has been slow due to lingering issues in the slap dash implementation of the texture synthesis library. While Wrap had a center parameter since it was written (Feb. 6) it was being ignored. I fixed that and tried adding a “bias” in the fitness metric to favor programs containing a given operator, to help create a texture to illustrate its effect. This was only marginally successful. 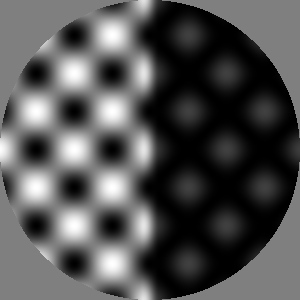 The texture to the left shows ray-like features converging on a spot in the lower right. This appears to be formed by nested calls to Wrap in the evolved program. I added Ring (Mar. 19) to the GP function set and gave it a center parameter. For both Wrap and Ring I made the sector count round instead of floor (a parameter of 5.9 produces 6 sectors not 5). 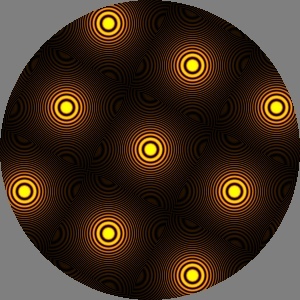 This texture was supposed to be a demo of Ring, and indeed there is a 6-fold division of the image. But instead of 6 copies of the same “pie slice” there seem to be 3 different patterns, each appearing twice on opposite side of the center point. 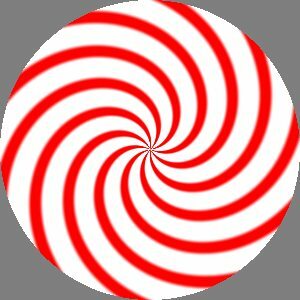 Also odd is that the center of “rotation” is really close to the origin. Yet none of the Rings in the source code specify a center near there. GP's evolved programs are often hard to understand. My application to texture synthesis is fortunate to have an alternate representation that is easily understood by our visual perception. Adding HueOnly (Mar. 23) seemed simple, its only parameter is the input texture. Shortly into the first test run I got an error in the RGB↔HSV conversion routines. It turned out to be caused by the dreaded NaN, usually the result of a divide by zero. The color space transformation were not at fault, they were just one of the few places in my code that did not silently ignore such results. Using HueOnly as a detector, I was able to track down three different bugs in my code. I fixed a divide by zero in Gradation when the two “vertices” were coincident, which can easily happen as a result of GP crossover. There was an issue in the Noise generators for a scale of zero which was really a bug in the SmallPosFloat type. Finally the NaNs lead me to a bug in Ring due to a misplaced “&”. 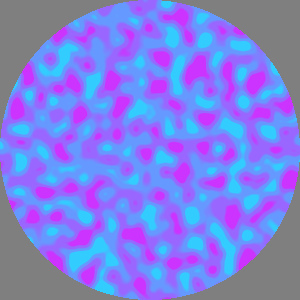 The saturated cyan and red patches in this texture are apparently produced by HueOnly. On November 12 I described a mismatch between a synthesized texture and the numeric constants in the printed version of the same evolved program. I found the problem went away when I turned off my new “jiggle mutations.” I had failed to understand that Open Beagle's representation of GP trees make extensive use of sharing. I had been mutating shared constants in place, causing unintended side effects. Prof. Gagné suggested I clone the constant, link the new one into the tree, then jiggle it. The image to the left is the best of a run where the population converged on programs containing several nested invocations of the Wrap operator. I plugged the “memory leak” where Texture objects created during each fitness test were not being deleted. My first quick and dirty fix managed to reclaim 97% of the objects (according to counters I put into the base class). I might have left it at that but got to worrying about the 3% causing a problem at a very bad time. So did the Right Thing and improved the code to reclaim 100% of allocated Textures. I also fixed CachedTexture to allocate pixel arrays only when caching is enabled and StretchSpot to allocate its look-up table only when needed. 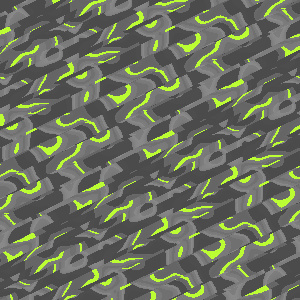 Its hard to tell but this texture's evolved program contains several StretchSpot operators. I was fiddling with the function set to try to get a more obvious example of StretchSpot but it refused to show itself. 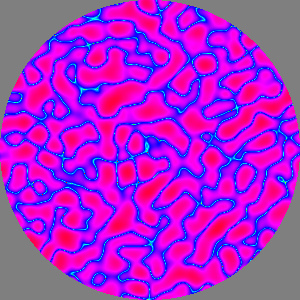 An interesting pattern based on several RadialGrads. White and purple Brownian layers made with SoftMatte. A combination of gratings produce the basic sheared grid near the center. What caught my eye was the aperiodic squeezing of the texture on the left and right. The evolved program contained several calls to Translate and one to Row. I really like this first texture. I had just added SoftMatte to the set of functions used in evolution. I turned off the gratings to look for other kinds of patterns. 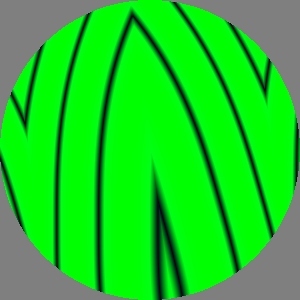 This looks like a green pattern was composited over a monochrome background pattern. When I looked at the evolved program, that was exactly what it was, see the code box below. But as I typed this post, I noticed the code does not match the image! 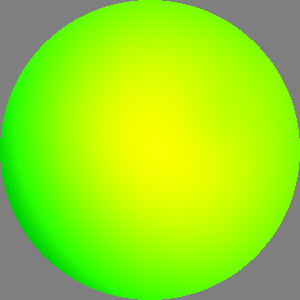 For example, the RGBs of the Pixel parameter to UniformColor indicate a desaturated magenta, not the pea green seen in this image. 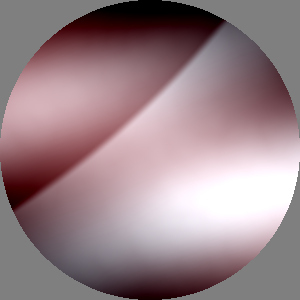 Similarly while the image shows a portion of a SoftEdgeSpot, it is not the same portion I see when I feed this evolved code back into my texture renderer. Could there be a problem with the printing of evolved programs? Specifically a problem printing the numbers? In addition to the functions mentioned in the November 8 post, these new texture operators have been added to the STGP function set: SoftMatte, Scale, Translate, Rotate, Row, Invert, Tint, StretchSpot and Wrap. These are all described in earlier posts in this diary. The stand-in fitness function GrayTheHardWay only looks at pixels in isolation. Texture operators that just move pixels around (like Translate) tend to have little effect on fitness. So they don't get amplified by evolution and may be discarded by mutations. On the other hand SoftMatte, Invert and Tint, do change pixel values and so appear more frequently in the “best of run” individuals. One such best program retained a Rotate of ColorNoise, probably an accidental “hitchhiker,” the ColorNoise was helpful, the Rotate didn't hurt and came along for the ride. An example with SoftMatte and some SineGratings. Other recent changes: I decided to remove the now prehistoric Monochrome operator (November 28) since the AdjustSaturation operator (July 16) now subsumes that functionality. I added a center parameter to both Rotate and RadialGrad. They had previously defaulted to the origin. See discussion on March 29 about why explicit parameters seem better than nested transformations in the context of genetic programming. I have also been reminded that I have a “memory leak” in my Open Beagle GP fitness function. That needs to be fixed. Nothing technically interesting here, I just liked this “glowing shiny yellow rope” pattern. GrayTheHardWay, my stand-in fitness function, has an strong preference for gratings. I tried adding a penalty for pixels with midrange brightness to see if it helped. It didn't. Mostly what evolved where combination of gratings arranged to produce high contrast patterns containing bright or dark pixels with few midrange pixels. I had to remove the gratings form the STGP function set to get other kinds of results, like this top image. 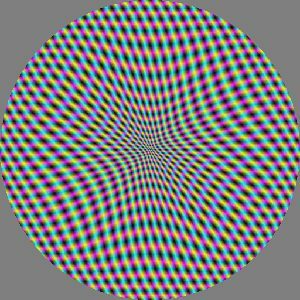 Several noise patterns are transformed to produce dark blue lines on a white background. // coc20091109f -- evolved code for "black spots on red spots on white"
I have added most of the texture generators previously defined in this library to the genetic programming function set specified in Open Beagle. 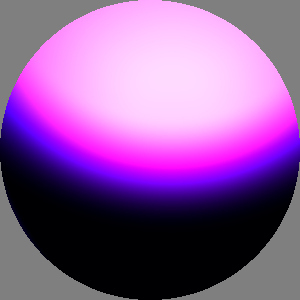 The generators now include: UniformColor, SoftEdgeSpot, Gradation, RingedSpot, SineGrating, SawtoothGrating, SquareWaveGrating, TriangleWaveGrating, SoftEdgedSquareWaveGrating, RadialGrad, Noise, Brownian, Turbulence, Furbulence and ColorNoise. The textures in today's post were made with the same small set of texture operators: Add, Subtract and Multiply. After I added RingedSpot (see Dec. 4) this texture was discovered by GrayTheHardWay (see Nov. 4). I decided that RingedSpot was too visually distinct and removed it. 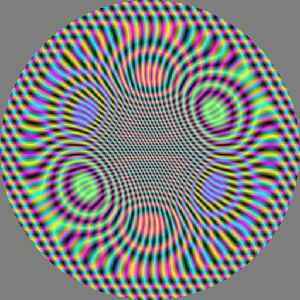 I think rotational patterns based on “1d textures” are a better approach (see July 4). 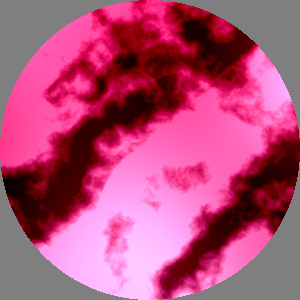 A dark red Brownian brightened by Noise to produce the pink and white highlights. A mixture of SineGrating, RadialGrad and several types of noise. As soon as I introduced these generators I started getting results that were just a single instance of one or the other. Basically they provide exactly the sort of texture that GrayTheHardWay is looking for. A slight evolutionary pressure to reduce evolved program size would soon optimize down to a single bare generator. I got around that by adding another criterion to the fitness function, requiring that a texture have at least 10% average saturation. A monochrome grad has zero saturation so can't compete. As a result I started getting lots of pale, pastel, 10% saturation gratings. We must choose which battles to fight, so I decided that was good enough. This is some combination of RadialGrad and SineGrating. The five grating generators presented a problem. I realized that the typical usages in this diary have frequency parameters up to 200. This is outside the range of my existing types of STGP ephemeral constants. I considered changing the parameterization of the gratings from frequency to wavelength. In the end I decided to introduce a new class of BigPosFloat values. This is Furbulence noise combined with some Gradations to produce this texture. To me it looks like a dyed anodized finish on textured aluminum. This was pretty surprising! That curved diagonal edge is apparently a large SoftEdgeSpot. The bar “behind” it is probably a SineGrating. Then the whole thing is softly tinted. Who knew? This combines SineGrating creating the vertical bars and Turbulence providing the smaller swirls. The light areas are pink and darks are cyan. See evolved code below. Next on the agenda is the rest of the texture operators described below. I turned off the “parsimony pressure” mentioned above that favors smaller evolved programs. (Its called a shrink mutation in Open Beagle.) In fact for this stage I would be happier to have larger programs which I expect to produce more complex images. I have had some trouble initializing the evolutionary population with larger programs in Open Beagle. I will be looking into that. Again I've been toiling in the trenches of genetic programming with images generated only as a by-product. Today some progress reports and a few images made during GP testing. Recent work focused on getting my GP “ephemeral constants” and their mutation to work correctly within the Open Beagle framework. These “ephemeral constants” correspond to the numbers in the code fragments in this document. I continued to receive a lot of helpful and timely advice from Professor Christian Gagné. I defined three types of floating point values for my strongly typed genetic programming: Fraction with values on the interval [0,1], SmallFloat on [-π,π] and SmallPosFloat on [0,2π]. Open Beagle provides a mechanism for choosing initial random values for these ephemeral constants, and for occasionally replacing them with new random values as a form of mutation during the evolutionary computation. I extended that mechanism to mutate these values “incrementally” -- to replace them with nearby values -- which is sometimes called “constant jiggling”. This turned out to be the most challenging part of connecting Open Beagle to my library. The rest of the interface was surprisingly easy. For the most part it Just Worked. As before these textures were evolved using GrayTheHardWay and a small set of two generators, three operators, two constructors, and numbers. The fitness function was modified since the previous post to require a nearly flat histogram of pixel brightness. That is: nearly the same number of pixels in the brightest bucket as in the middle bucket as in the darkest bucket. In these examples, a texture gets a “point” for each histogram bucket that is 95% full. Since then I changed it again to give “partial credit” for partially full buckets. I reverted the change mentioned on October 23 regarding taking the absolute value of some evolved parameters. This was solved by the SmallPosFloat type. The next step is to work through this texture synthesis library writing the short bit of “glue code” needed to add each element to the GP function set. This is the first batch of test images from evolution runs using a small subset of the texture synthesis and a simple prototype fitness function I call GrayTheHardWay. Its goal is a texture whose average brightness is about 50% but which is composed of mostly non-midrange pixels. This top image is a simplistic, visually stark, solution discovered in early testing. As I tinkered with the fitness function I replaced the “non-midrange pixels" criteria with one requiring “no large areas of flat unchanging pixel values” which produced the other five more visually interesting textures below. They may now be “too midrange” so I will try adding another criteria that scores higher for images having a wider distribution of brightness values. The GP function set used here consists of the generators UniformColor and SoftEdgeSpot, the operators Add, Subtract and Multiply, constructors for Pixel and Vec2, plus numerical constants. The numbers were of type Fraction randomized on [0,1]. Thats fine for RGB components. But when used for Vec2 positions they all end up in the first (upper right) quadrant. As a result these look a bit like shaded spheres (planets?) with highlights in that corner. I tried fixing this with two different types of “ephemeral constants” but that seemed to confuse Open Beagle, probably because they were both based on the same underlying C type. I'm looking into that. (1) added center parameter for SoftEdgeSpot as discussed on March 29. In the interest of full disclosure I should point out that these 6 images were hand picked for visual interest from 15-20 evolution runs. The GP runs used a population of 100 in 5 demes of 20 individuals, with steady-state reproduction, for 100 generations. They took roughly 1 to 5 minutes to run on my laptop. In case anyone has been checking this page regularly, I apologize for the lack of posts over the last month. I have been learning about and experimenting with the excellent Open Beagle library for evolutionary computation. After a long period as a confused newbie, I have finally performed test evolutions of procedural textures using a subset of my library and a simple fitness function. I was guided through this process with a lot of helpful, patient advice from Open Beagle's principle author Professor Christian Gagné at Université Laval in Quebec, and from another experienced Open Beagle user, Sergiy Dubovik of Helsinki. Thus far the evolved textures are uninteresting (imagine a middle gray circle on a middle gray background) so no picture with today's post. The subset of my texture synthesis library that is “known” to Open Beagle consists only of the generators UniformColor and SoftEdgeSpot, the operator Add, constructors for Pixel and Vec2, plus numerical constants. This subset was intended merely to test the operation of the type matching required in my application. Open Beagle provides support for many styles of evolutionary computation. I am using genetic programming, particularly strongly typed genetic programming (“STGP”, which allows for mixtures of types like Texture, Pixel, Vec2 and numbers) using a steady state population (where individuals are replaced one by one rather than as synchronized “generations”). A small bit of programming is needed to make each texture synthesis generator or operator known to Open Beagle. So it will take a little time to include each of the 60 (!) types that have been defined in this library. I will use this opportunity to review the library: some operators will be removed, some arguments will be changed (like adding a center parameter for SoftEdgeSpot as discussed on March 29). I will also be refining the numeric types and the way they are mutated during evolutionary computation. 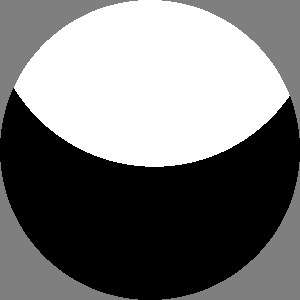 Related to the roundness metric mentioned yesterday: an operator to take the square of the difference between two textures. This “difference squared” is a widely used mathematical tool to measure similarity, often by integrating difference squared over a range. Larger results mean less similarity. Squaring serves two purposes, it makes all differences positive and emphasizes larger differences. Although in the context of this texture synthesis library, values are normally on the range [0, 1] so differences are normally on the same range. Squaring such fractional differences makes them smaller. Possibly it would be better to take the absolute value of the difference? Or perhaps in either case the result should be adjusted by an exponentiation within the same operation? Update: I replaced DifferenceSquared with a slightly more general ExpAbsDiff on November 30. 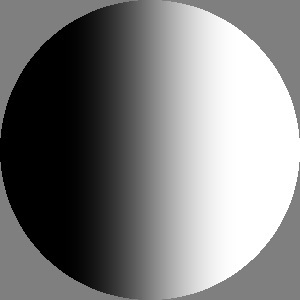 In both of these examples, the result of DifferenceSquared is adjusted using Gamma and then colorized with BrightnessToHue. The top image shows DifferenceSquared of Noise and middle gray. 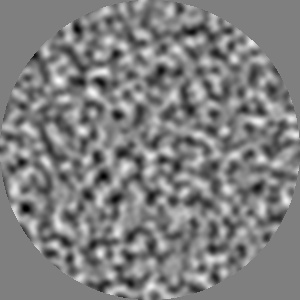 The bottom image shows DifferenceSquared of two different portions of Noise. 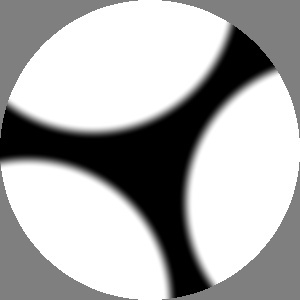 I am working on a side project spun off from thinking about the “unround” nature of finite/truncated Gaussian filters. 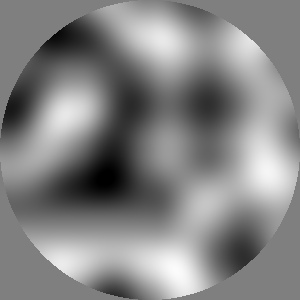 Ken Perlin suggested “spin blur” of an image as a basis of comparison for measuring its roundness. 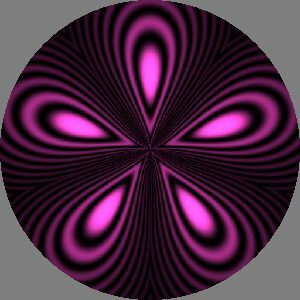 I have prototyped that using this texture synthesis library. I am not sure if this would be a useful operator for evolutionary texture synthesis since its result is very similar to existing operator (see discussion for the bottom image on July 4). 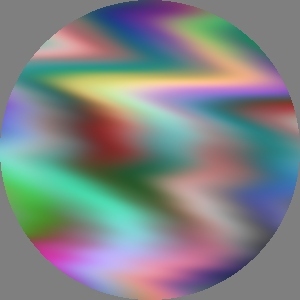 This experimental SpinBlur operator produces an effect like spinning an image on a turntable while taking a time exposure photo of it. 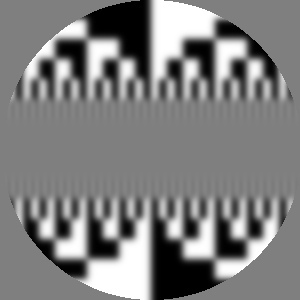 It averages the pixel values along a given radius. 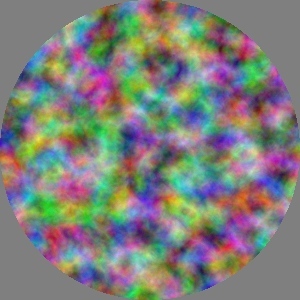 This is implemented by scanning a grid of pixel samples and adding the values into a 1d texture accumulator. A count is associated with the pixel accumulator for each radius interval which is used to normalize the result. The output for a pixel is looked up in this 1d table indexed by radius. Note the aliasing evident in this image, especially near the bright spot in the middle and along the main axes. I assume this is a moire/interference between the pixel grid and rotated 1d pixel lookup table. This may warrant an improved implementation. Speaking of side projects, work on texture synthesis has been slow recently as I have been spending time learning about Open Beagle, the open source engine for evolutionary computation I plan to use with this texture synthesis library. 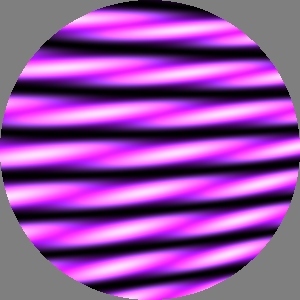 This SoftEdgedSquareWaveGrating texture was used as the input to SpinBlur above. Building on the recently improved Blur operator, I revisited the edge enhancement prototyped on July 20. Today's results made with two new operators are almost identical to those earlier experiments, except that these images show the effect of the operators on colored images. 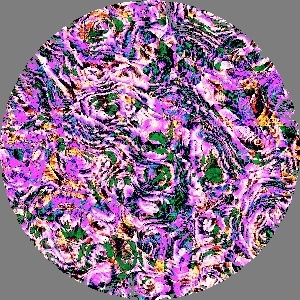 This blobs texture was made by thresholding three sections of Noise and using them to matte three colors over gray, see code below. This image shows the result of the new EdgeDetect operator with a filter width of 0.02 applied to the top image. As in the July 20 example, the EdgeDetect operator is a high pass filter that returns the signed edge detection offset by (added to) middle gray. Note how the inside of the blob boundaries have a gradation of the blob's color, while outside the boundaries have the inverse color. So the red, orange and yellow blobs have “halos” of cyans and blues. This is the result of the new EdgeEnhance operator using filter width of 0.02, and a value of 2.5 for enhancement “strength”. The signed edge detection signal is multiplied by strength then added to the input to produce this result. As mentioned below, this approach is also known as unsharp masking. OK, the mysteries from the previous entry have been cleared up and there is now a better Blur operator. As noted on August 14 (second and third images) the blurred result was not radially symmetric as expected. The cause turned out to be my overzealous clipping of the “tails” of the Gaussian filter in order to limit the size of the convolution computed for each pixel. 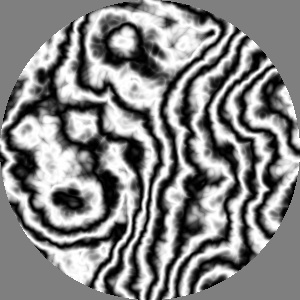 This contour-map image shows an improved “rounder” version, although you can still see a bit of four-fold lumpiness near the center. I've decided this is a reasonable trade-off between quality and computation speed. Similarly the blurred version of ResolutionTest now has less (but not zero) high frequency content. I renamed this new Gaussian filter Blur and renamed the old operator to be Old3x3Blur. 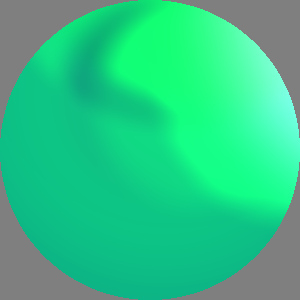 Blur is now called with two parameters: a filter width (radius) and the texture to be blurred. I added a second constructor to Blur to provide the old 1-arg calling sequence with 0.005 for the default width. I added a hack to avoid long computation times for huge filter sizes: if the filter width is greater than 0.25 then Blur will simply return the texture's average pixel value. This is pretty ad hoc and subject to further review. It has been three weeks since the last post. That has something to do with SIGGRAPH 2009, but only one of those weeks was the conference itself. Perhaps SIGGRAPH's “schedule distortion field” extends out another week on each side. Which brings me to wide blur kernels. I wrote most of this code on the flight back from New Orleans but didn't finish it up until today. This is the input image before blurring. This is a wide low pass filter kernel applied to the white spot in the top image. 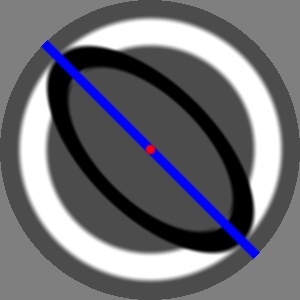 The sharp-edged spot has a radius of 0.3 and the blur kernel has a radius of 0.2 (for context, the entire image has a radius of 0.5). The blur kernel is formed with two perpendicular applications of a a 1d Gaussian. I used the Gaussian because this separability leads to a fast implementation and because the resulting impulse response or point spread function is nice and round. 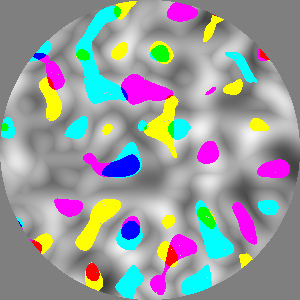 I used Colorize with a SineGrating to make this contour map of the blurred spot above. It is hard to ignore the presence of some squarishness in there. 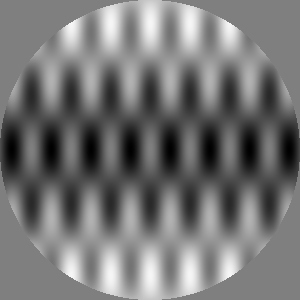 Near the center, and near the boundary of this texture image, the contours I expected to be circular instead show four-fold undulations along the main diagonals of texture space. That can't be right. I haven't yet found a problem in my code. I tried to compare the performance of the old and new Blur. I found the effective filter width of repeated applications of the old 3x3 filter was less than I expected (which was one pixel of radius increase per iteration). 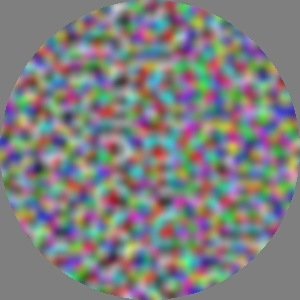 Tests show a Gaussian filter width of 0.05 is visually comparable with 40 iterations of my old 3x3 Blur filter (yet the transitions in this image seem to be about 26 pixels). The Gaussian blur was about ten times faster at this filter size: 0.43 versus 4.03 seconds. The Gaussian's cost is proportional to the filter width so I am considering how to limit that value to a reasonable range. Otherwise evolution (GP) could blithely decide to use mile-wide filter kernels. I may just say that beyond some limit, assume the filter is “really big” and return a single average color. Yet another mystery is that a surprising amount of high frequency information is preserved in this blurred ResolutionTest from March 28. 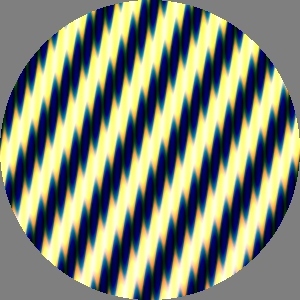 While the original pattern did have infinitely sharp edges, compare this to the image of June 28 made with multiple applications of the 3x3 filter. 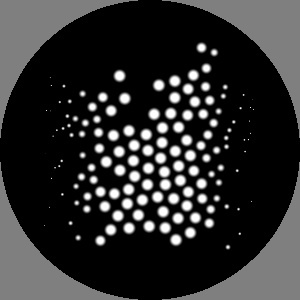 I have been looking at ways to parameterize patterns with “lots of spots” using SoftEdgedSpot as the drawing element. 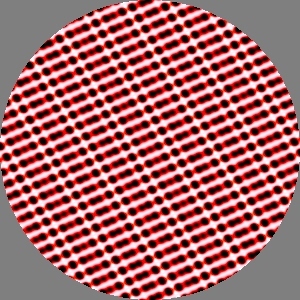 In this top image the centers of 60 spots are uniformly distributed over a given disk. The outer radii are uniformly distributed between two given bounds. 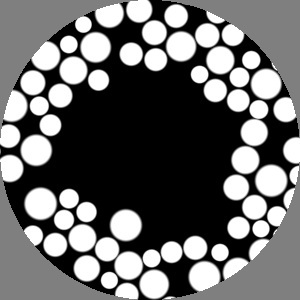 (The inner radius for the transition from black to white is 80% of the outer radius producing the relatively hard edged spots shown here.) 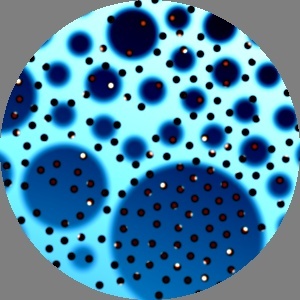 A simple iterative relaxation procedure is used to avoid overlap by pushing the spots apart. Here the likelihood of a spot appearing at a given location is specified by a texture parameter. 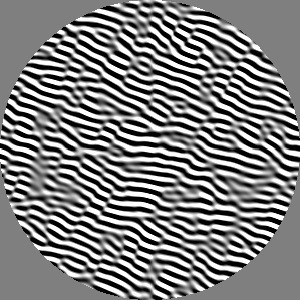 In this case that texture has zero likelihood (brightness) at the center and gradually climbs up to one near the outside. (Yet the transition between spots and no spots seems surprisingly abrupt. This may result from spots near the crowded outside “pushing” their neighbors toward the center.) This image contains 70 spots. Here the distribution of spot centers is again uniform. 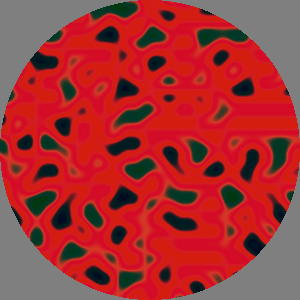 A second texture parameter is used to modulate the radii of 100 spots. 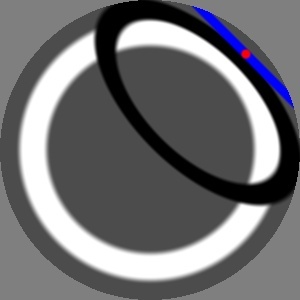 In this case the radius map is bright in the center and darkens toward the edge. 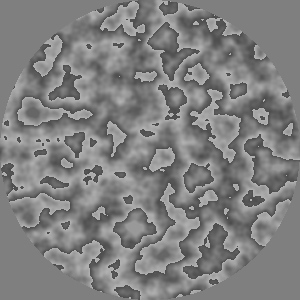 Perhaps the final LotsOfSpots operator will have texture parameters for both likelihood and radius. 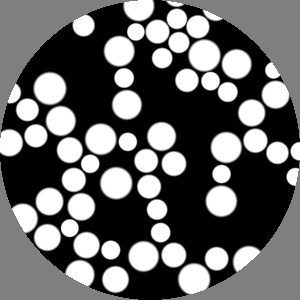 Similarly, instead of drawing all spots in white, it could take another texture to provides a color for a spot drawn at any given location. (As in Paul Haeberli's 1990 Paint by Numbers: pdf, pictures, applet.) 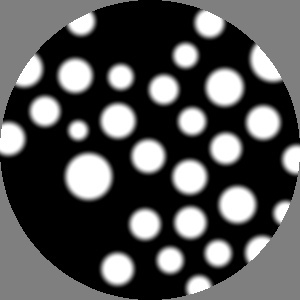 Or rather than draw featureless spots, the operator might take another parameter to provide color texture inside each spot. (As in the random stamper prototype described on May 9.) A given disk of this texture would be scaled to fit into each spot. My original September 20 to-do list included two convolution-based operators: blur and edge enhancement. I wrote a simple 3x3 Blur on November 28 and a 3x3 edge detector on November 29. 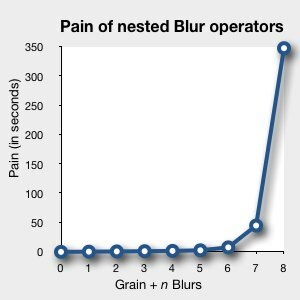 Blur could stand in for low pass filters with larger kernels by repeated (nested) applications of the 3x3 filter. But a 3x3 edge detector is too small to be useful. I still need large kernel high pass filters for edge detection and enhancement. Today I experimented with unsharp masking. A high pass “edge detecting” filter is created by taking an input image then subtracting off a blurred version of itself, leaving a residue of high frequency edges. Adding the high frequencies back into the original image serves to “enhance” the edges. This top image is the input. 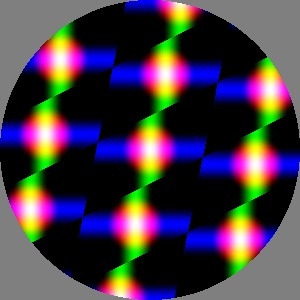 Brightness is 80% in the center and drops by half each step. The middle image is the result of prototype edge enhancement applied to the top image. It is the sum of the original input and the high frequencies seen in the third image. 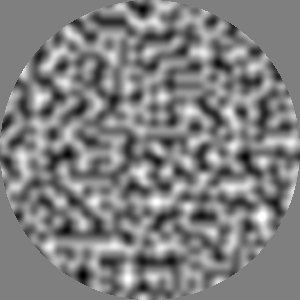 In this example the low pass filter used had a kernel diameter of 21 pixels (10 iterations of the 3x3 Blur operator). The high frequency texture was scaled by 2 before being added to the original input. My daughter, a frequent contributor to this diary, remarked that the top image looked “flat” while the enhanced middle image “really looked 3d.” I was not aiming for a 3d look but indeed its not hard to interpret this as the top view of a stepped cone. The bright “lip” on the inside of the edges could be seen as highlights on rounded corners. 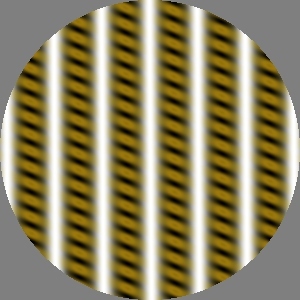 The dark “trough” on the outside of the edges could be seen as shadow. This bottom image shows the high frequency edge detection. It is a signed value which is shown here added to 50% gray. The middle image shows the sum of this edginess texture (see code below) and the top image. In the process of this experiment I wrote the long neglected Subtract operator. I added a Max (and Min) operator that combines two textures by selecting at each pixel the input that is brighter (or darker). 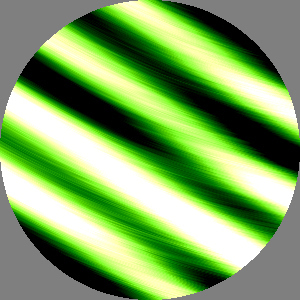 In this case two half-brightness, perpendicular, diagonal SineGrating textures are combined with Max. For comparison, here are the same two input textures combined with Add (on the left) and Multiply (on the right). Adding the two textures together leads to something like a foam “egg carton” pattern with peaks twice as bright as the input texture. Multiplication leads to isolated peaks at half the brightness of the input. In contrast the Max operator simply merges the two inputs, preserving the geometry and brightness of at least one input. 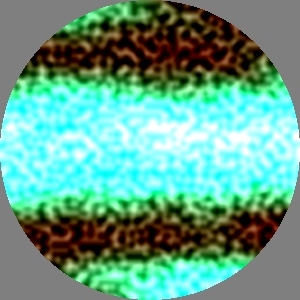 Here two portions of Perlin Noise are tinted yellow and cyan then combined with Max (see code below). Think of this as two undulating intersecting surfaces. 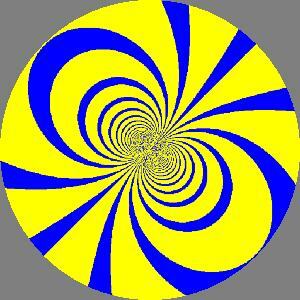 We see shades of cyan where it is brighter (higher) and shades of yellow where it is brighter. This Mirror operator simply reflects a texture about an axis specified by a point and an angle. In this example, colored Turbulence is used as the input texture and zeros for angle and center specify the Y axis for mirroring. After adding operators for adjusting brightness and saturation, the HSV adjustment suite is now rounded out with AdjustHue which takes a hue offset and adds it to the hue of each pixel (wrapped back onto the range [0,1]). This first image is the input. 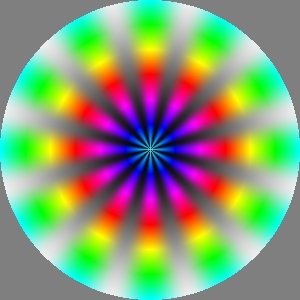 Note the hue progression along the spokes goes from red at the center through cyan at mid-radius and back to red at the outside. 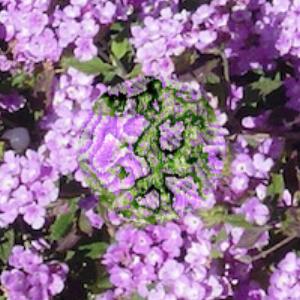 This is the result of applying AdjustHue with a parameter of 0.5 to the top image. 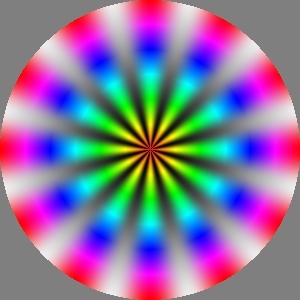 The gray background gradation is unchanged while the hue progression now goes from cyan at the center through red at mid-radius and back to cyan at the outside. Upon reflection I decided that my July 14 implementation for AdjustSaturation was utter hogwash. Because the RGB↔HSV conversion wants saturation to be on [0,1], adjusting saturation with a gamma-like exponentiation seemed like a good idea. But it has the minor drawback of doing the Wrong Thing. If a pixel in the input texture is fully saturated (has a value of 1.0) it could never be reduced by exponentiation. I changed AdjustSaturation to interpret its numeric parameter as a scale factor. 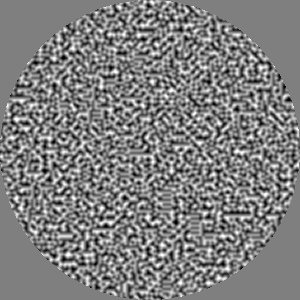 Each pixel's saturation is multiplied by this factor, then clipped onto the interval [0,1]. While this could lead to Mach band artifacts when saturation goes out of range, I think it is closer to what the operator should do. Nonetheless, the difference between the new and old implementation is very subtle for most textures like the pastel test case used here. Today's image shows the second image from July 14 with its saturation increased by a factor of 1.5. It is very similar to July 14's third image. While thinking about HDR representation on December 5, I made a list of additional To Do items, like operators for brighten and darken (now covered by the Gamma operator) as well as tweaking hue and saturation. Today I wrote an AdjustSaturation operator that works like Gamma to push mid-range values up or down. Saturation values are defined by HSV to be on the interval [0,1] so gamma style exponentiation alters the mid-range while leaving the ends of the scale unchanged. This middle image is the starting point for the other two. It is the colored Furbulence texture (third image on July 9) “averaged” with white: the two textures were added together then divided by 2. On May 8 I prototyped ColorNoise but didn't decide to officially add it to the library until July 3. Today I prototyped these three colorful versions of fractal noise and then decided not to add them to the library as predefined named functions. While one generator for a multicolored pattern seemed like a good idea, four seems like overkill. Nonetheless, I thought they were attractive and unique enough to mention here. 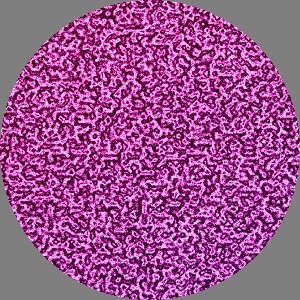 In this example, three different portions of Brownian noise were tinted in red, green and blue then added together. See the code snippet below. All three of today's images were made with analogous code. See May 18 for the scalar grayscale versions of these three textures. 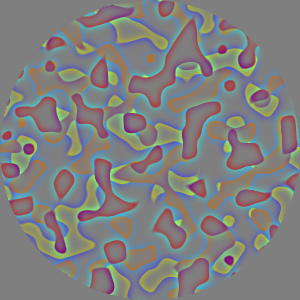 Three portions of Perlin Turbulence, tinted in red, green and blue then added together. Three portions of Furbulence, tinted in red, green and blue then added together. The April 12 post mentioned adjusting image contrast by “remapping pixel intensities through an exponential as in gamma correction” before going off on another tangent. Today I returned to that original intention and added a Gamma operator. A common use of gamma correction is adjusting the abstract “perceptual” or “linear” brightness values used in computer graphics to better match the contrast response of a given display device. In this library it is being used simply to alter a texture by pushing more of its dynamic range into lighter or darker values. Note that in all three cases the total dynamic range of the texture is unchanged, spanning almost all of [0,1]. The darkest parts remain dark and the brightest parts remain bright. It is the midrange (intermediate brightness values) that shift up or down. See these plots of the contrast curves. Of the two approaches discussed in the previous entry I seem to be leaning toward defining “waveforms” (1d textures) as the y=0 slice through a 2d texture rather than as a separate type. Certainly that approach requires fewer changes to the library and its interface to genetic programming. 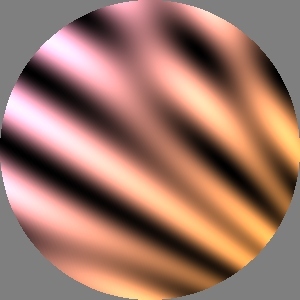 In this image the 1d texture is indexed by the angle of each pixel by the new SliceToRadial operator. 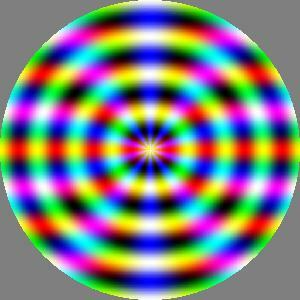 As a result the colors along the 1d slice of ColorNoise become colored rays emanating from the center. 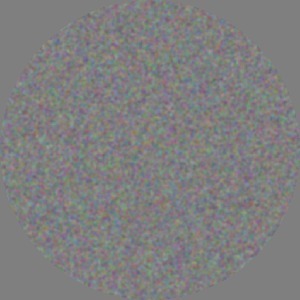 Here the brightness of one texture (see June 8 and 9) is used to index into a 1d texture (from ColorNoise) to select a color for the result. This new operator is called Colorize. 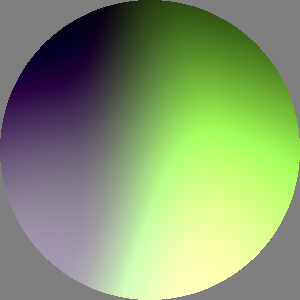 Brightness values on the interval [0,1] in the texture being colorized will map to x values on [0,1] along the y=0 slice of the texture providing the colors. Brightness values are nominally on [0,1] but this operator does not depend upon that. 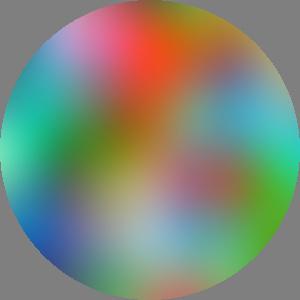 Since I've shown no reluctance to endlessly grow this library, it may come as a surprise that I decided against adding an operator to “sweep” a 1d-texture around a point creating rings of the colors along the input texture's positive x axis. I wrote an experimental version then realized the same effect can be obtained with the Wrap operator described on February 6. The two code fragments below both produce the image to the left. Since December 20, there have been several references to what I later called the “waveform as first class object” design issue. This post is just discussion before any changes are made. The concept of waveform first came up in the context of gratings. It seemed clear that “gratingness” was independent from the choice of “waveform” the variation of brightness that defines the nature of the grating. So perhaps there should be a Grating operator that takes a waveform as a parameter. Since back then there was no abstraction for waveform, as a temporary measure, I defined four generators of gratings for the four basic periodic scalar waveforms from signal processing: SineGrating, SawtoothGrating, TriangleWaveGrating and SquareWaveGrating. So there could be a Waveform base class which could be specialized for those four waveforms. However it seems like an important degree of visual expressiveness would be provided if waveforms could be defined just like textures: by the composition of generators and operators. Instead of a scalar “waveform” perhaps the new first class object is a “1d texture” or “colored string” or “pixel row”. The top image is the row of pixels through the middle of a texture (see the second image for April 7) with the rest of the texture colored like the mid-range gray background. Imagine this being the result of applying a Convert2dTextureTo1dTexture operator. Then you could take that waveform (or 1d texture, as you can tell I'm struggling with nomenclature) and pass it to a generic Grating operator to produce this second image. The operator would stretch (smear?) the 1d texture perpendicular to its axis to create a 2d texture. So an equally good name for Grating would be Convert1dTextureTo2dTexture. But wait, what if this generic Grating operator took a Texture rather than (lets just call it) a Waveform? What if it implicitly converted (coerced in programming language terms) the texture to a waveform by the simple expedient of ignoring all but that center row of pixels? 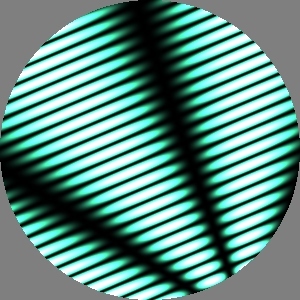 So this second image could just as well be the result of passing that April 7 texture to a generic Grating operator which takes a texture for its “waveform” parameter. That is what I am wrestling with now. Is it better to have a Waveform class with operators to convert between Textures and Waveforms? Or is it better to have just one Texture class which in certain circumstances is interpreted as a 1d texture/waveform? Simplicity is one argument for one rather than two classes. Conversely it might be seen as overloading the concept of 2d texture to include 1d texture functionality. From the standpoint of GP, having two classes requires using “strongly-typed GP” (which might be desirable for other reasons) and also creates some genetic separation between the two classes (which might be a good thing). One ironic outcome from the “all textures are 2d, but are sometimes interpreted as 1d” approach would be that I am left with the original issue from last December: how do I define a sine wave (etc.) grating? If I use the generic Grating operator, what is the input texture? It seems like the only solution is to define stand-alone texture generators that have a scalar (which is to say, gray scale) waveform along their y=0 axis. And that, it turns out, exactly describes those “just temporary” generators from December 20: SineGrating, SawtoothGrating, TriangleWaveGrating and SquareWaveGrating (and subsequently on April 3, the oddly named SoftEdgedSquareWaveGrating). My old laptop was getting slow and decrepit, just like its owner. So last week I upgraded from my 4.5 year old PowerBook G4 to a new MacBook Pro. The new machine is much faster along several dimensions (higher clock speed, 2 cores, more cache, etc.) and I wanted to know how much faster it was on the calculations used in this library. 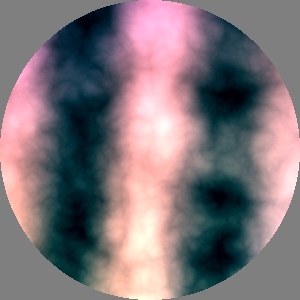 I made a test case with Blur applied 20 times to the ResolutionTest texture generator from March 28. On the old machine it took 12.27 seconds. On the new machine it took 1.77 seconds, roughly 7 times faster. In the process I fixed an old pixel addressing bug in the CachedTexture class that also broke the ExperimentalRandomStamper used for “Sparse Gabor Convolution” on May 9. 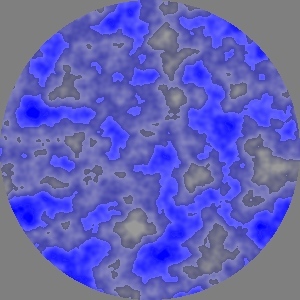 While fiddling with Wrapulence I tried a variation then realized it was “just fmod of Brownian.” Not much to do with turbulence or fractal noise, but it seemed like a good idea in general to provide an operator to do a wrap-around (remainder, modulus) on the brightness of a given texture. 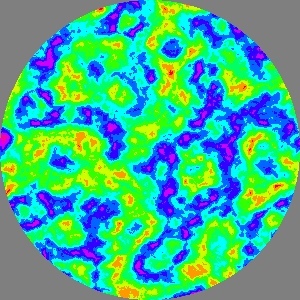 This image shows BrightnessWrap applied to Brownian noise, with the bounds of the wrapped region of intensity set to 0.3 and 0.7. It converts the full range and smooth input to mid-range values with discontinuous jumps. The irregular boundaries and hard edges give this somewhat of a grunge quality like layers of corrosion and peeling paint. This is BrightnessWrap applied to an input like the “Brownian sky” in the May 15 entry. See code below. Describing the May 18 Furbulence generator to a friend I said that tweaking Turbulence to include a second “fold” suggested other ways to “add discontinuities at all scales” as Perlin originally described Turbulence. One of those was to simply scale up the amplitude of the underlying Noise signal, then apply wrap-around on the interval [0,1]. 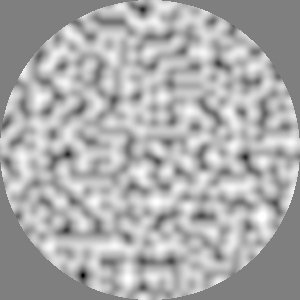 For this image Perlin Noise on the range [-1,1] is scaled up to [-3,3] then wrapped onto the range [0,1], using something like the modulus or reminder operator (literally: v-floor(v)). The rather wacky result may not have any practical applications but it is certainly unique. My daughter especially liked it (“that is soooooo cool!”) which is justification enough to describe it here. 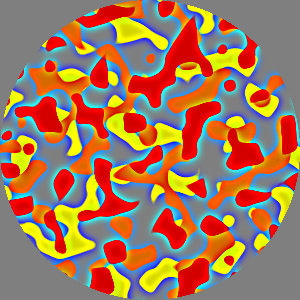 While Turbulence contains first order (slope) discontinuities at all scales, this Wrapulence texture has zero order discontinuities (sharp boundaries between light and dark) at all scales. As a result the new texture is much “edgier” with sharp changes in brightness everywhere. In general that is considered a bad thing from the perspectives of signal processing, image quality and bandwidth. As mentioned on May 15, the ad hoc density slicing operator had undesirable hard edges between its color steps. Here are some textures produced with two new and improved density slicing operators. Each take 10 colors as parameters. 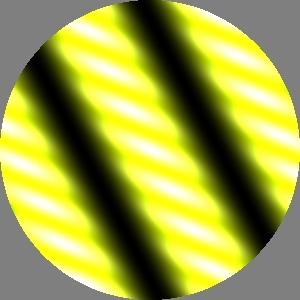 (In these top two images, the colors are 8 copies of 30% gray plus yellow and white in intermediate positions.) 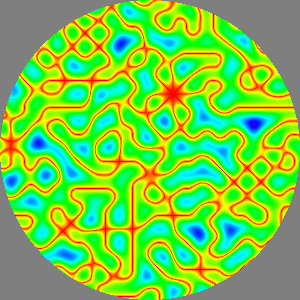 In the top image the DensitySliceTenRamps operator maps brightness into one of 9 linear ramps between the 10 given colors. 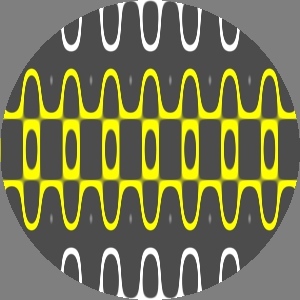 You can see bright Mach Bands in the yellow regions caused by slope discontinuity between two ramps (one going from gray to yellow adjacent to one going from yellow to gray). 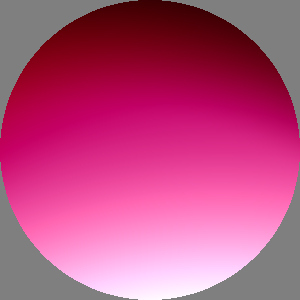 This is a call to DensitySliceTenSteps which maps brightness into one of 10 flat color steps. It differs from the earlier experimental density slicer by providing soft edges between the steps with a softness parameter between 0 and 1 specifying the width of the transition zone. It is 0.3 in this example. It uses the same 10 colors as in the top image. DensitySliceTenSteps with the same input texture and different parameters: softness is 0.7 and there are 7 unique colors, as shown in the code box below. Some of the recent experiments with noise textures were portrayed with scalar (B&W) noise colorized by a simple hard-edge density slicer. I later realized that there was a very simple way to map brightness values onto a continuous hue scale using the existing RGB/HSV conversion routines. 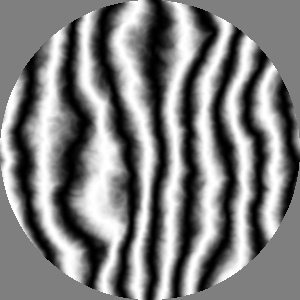 This sample gray scale texture is the sum of three sine wave gratings, see code below. Here the gray scale input is colorized by mapping brightness values onto the continuous hue scale using the new BrightnessToHue operator. Because hue values are cyclic, this “fmod”-like mapping conveniently handles brightness values outside the range of [0,1]. 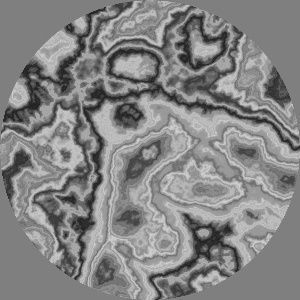 I have been experimenting with the Marble texture described in Perlin's 1985 paper. 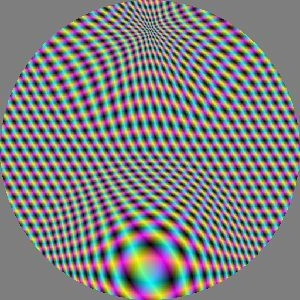 He takes a (potentially colorized) vertical sine grating and at each pixel shifts its phase horizontally by the value of Turbulence. 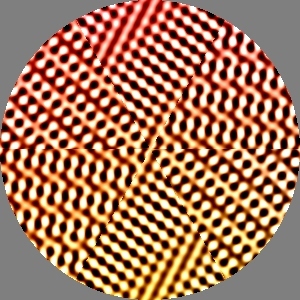 The result ranges from a pure sine grating, to a noisy grating, to a strongly warped grating, to a fairly chaotic pattern of warped dots and rings. The bottom image shows about 1.5 cycles of the sinusoid with a strong turbulent component. I haven't given code fragments or other concrete descriptions of these images because I not sure I fully understand the parameterization of this texture. (Even if we ignore coloring issues, as in these B&W examples.) In addition to scale and translation for the underlying Turbulence, there is also the frequency and angle of the sine grating. Perhaps also a scale factor relating the [0,1] range of Turbulence to an angular phase. That is, my code has such a factor but maybe it could be made a constant without loss of generality? 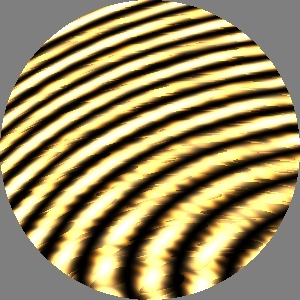 Ken's definition of Marble using a sine wave and Turbulence has been widely applied in computer graphics and other fields. Yet as was noted in the April 7 discussion of SineShear, there are interesting waveforms beyond sine, such as described on December 20 (square, triangle, sawtooth) and many others that could be defined procedurally. This seems to suggest another argument for “waveforms as first class objects” in this library. Perhaps another version of Marble could turbulently displace the phase of an arbitrary waveform passed in as a parameter. An even more generalized Marble operator could take a waveform (playing the part of SineGrating) and a texture (to be used like Turbulence) then form the “marbleized” combination of the two. As noted on May 15, my implementation of Perlin's 1985 Turbulence texture seemed to be full of annoyingly anisotropic vertical, horizontal and diagonal features, as in the bottom image. 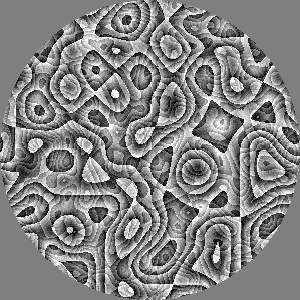 Since “I happen to have Prof. Perlin right here” (*) I asked and Ken said that to avoid this artifact, he simply rotates the texture between each level of the fractal summation, as shown in the nicely isotropic top image. Note that features in both images are the same at the fundamental (lowest) frequency. 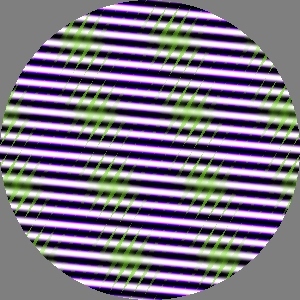 For example, there is a nearly circular feature just below and right of the center of both textures. I now rotate each subsequent octave of Noise by 2 radians (plus, as before: doubling the frequency and halving the amplitude). I chose 2 radians because it is roughly 1/3 of a revolution but will never re-align with the irrational value (2 pi) of a full rotation measured in radians. As mentioned in the May 15 post, Perlin Turbulence is similar to Brownian noise except that it “folds” Noise using an absolute value in order to add discontinuities at all scales. A result of that is that Turbulence has sharp “valleys” with soft “peaks.” Thinking about that asymmetry I wondered what would happen if I used two absolute values to make two folds in the Noise signal. Folding the tops down and the bottoms up produces a curve that has sharp and soft features at both the top and bottom of its range. Here we see a density slicing of this new variation on Turbulence. 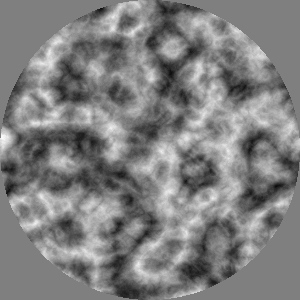 This image shows the new texture in its raw grayscale scalar form. I had copied the code for my Turbulence generator, renamed it and tweaked it to try the double folds. Calling it “turbulence 2” seemed unimaginative. I thought that the dark and light “tendrils” give the texture a wispy, furry appearance, so I started calling it Furbulence. Here for comparison is raw Perlin Turbulence. Note how all the sharp features are dark. The bright features are soft and puffy, broken by dark cracks. Here for comparison is raw Brownian Noise, where both the peaks and valleys are soft and smooth. More bounty from Ken Perlin's 1985 SIGGRAPH paper An Image Synthesizer. Here we see Brownian noise, a sum of octaves of Noise: a fundamental frequency plus additional copies, each with twice the frequency and half the amplitude of the previous copy. In the abstract, a texture constructed this way has features at all scales. (While an image of this resolution can only represent about 8 octaves.) I am not certain of its origin but I associate the use of “Brownian” to describe this kind of 2d fractal texture with Benoît Mandelbrot. 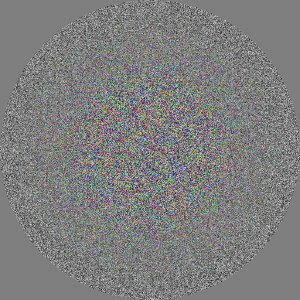 In this image the noise pattern is colored to suggest a layer of high thin clouds beneath a blue sky. 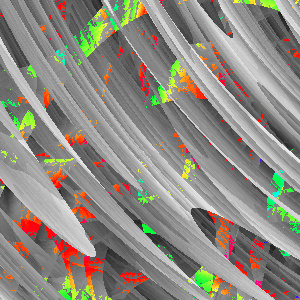 This is the same Turbulence texture colored with an experimental operator for density slicing. 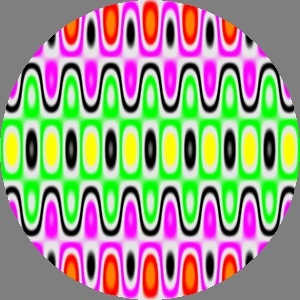 It divides the intensity range of [0,1] into ten regions and assigns a color to each. (Here a selection of four colors are each assigned to multiple bands.) I think a better density slicing operator should provide either soft transition zones between the bands, or else color each band with a ramp between its two neighboring colors. According to the authoritative but unofficial list by Ke-Sen Huang a paper called Procedural Noise using Sparse Gabor Convolution by Lagae et al. will be published at SIGGRAPH 2009. (As of this writing the official list of papers has not been released.) So far only an intriguing video is available on the project's website. Beyond describing this novel type of textured noise, the video demonstrates a user interface for authoring noise, and techniques for mapping the texture onto arbitrary dynamic 3d shapes. The implementation is apparently quite efficient, running in real time. 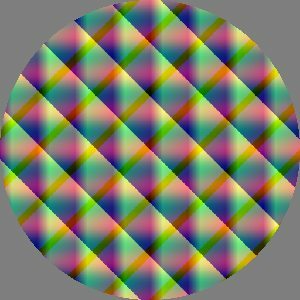 The video inspired me to make a prototype implementation in my texture synthesis library. The top image is the first result. This is the sum of 2000 Gabor kernels each with a random position and a rotation by an angle uniformly distributed between two given angles. The middle image shows the sum of the first few kernels. Lagae et al. also allow the frequency of the kernel to vary between two bounds. Mine were all the same. This is the input texture used as the kernel. A Gabor kernel is defined as the product of a sine wave grating and a Gaussian spot. This is in fact a cosine wave grating times a (co)sinusoid spot, since those two generators already existed in the library and are visually similar. The kernel is shifted down in intensity from [0,1] to [-0.5,0.5] then passed to an experimental random “stamper” which adds a given number of copies into an accumulation buffer. 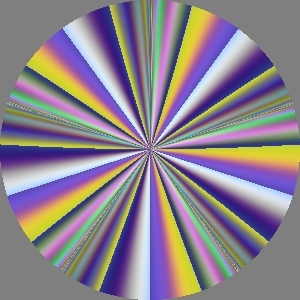 Each copy is rotated by a random angle (between two given bounds) and translated by a random vector (in a given circle specified by radius and center). My prototype is so not real time, the top image took several minutes to complete compared to interactive rates for the Lagae et al. system. Just playing with my new toy. 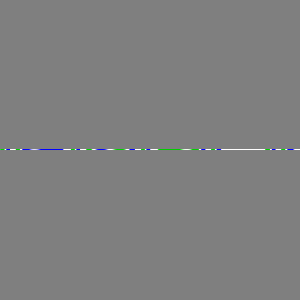 This image is made with three copies of Noise shifted relative to each other. Each copy is then tinted with red, green or blue and the three are added together. Compare this to other kinds of “blurry confetti” in the April 12 and March 23 entries. Again three copies of Noise tinted with the primary colors and added together. In this case it is three “octaves” of Noise. The lowest frequency and highest amplitude is tinted blue. The green layer is half the size (twice the frequency) and half the amplitude as blue. The red layer is half the size and half the amplitude of green. Without the tinting seen here, this summing of octaves of band limited noise produces 2D Brownian noise. This classic fractal with 1/f power spectrum was described by Mandelbrot. In his 1985 paper, Perlin gave the name Turbulence to the summation of the absolute value of octaves of Noise. The original specification for this library included a generator for Perlin Noise, an enormously influential concept in procedural modeling introduced by Professor Ken Perlin in his landmark 1985 SIGGRAPH paper An Image Synthesizer. Perlin's Noise has had a huge impact, but is just one of a stream of innovation that has flowed from the mind of this modern polymath. If I gush too much it is because I am proud to consider Ken a friend and to have been his colleague since we met in the early 1980s as young geeks laboring on the production of the cult classic computer animated film TRON. 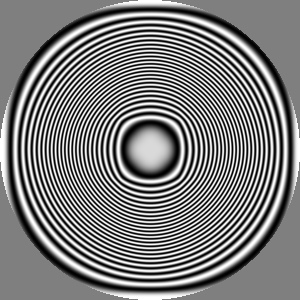 This image shows a unit diameter circle on the z=0 plane of Noise scaled down by 16. The top image is the same but four times bigger. The bottom image is 4 times smaller. 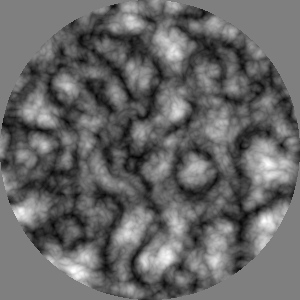 A key property of Perlin Noise is that its scalar value is defined over continuous three dimensional space (ℝ3) making it a “solid texture”. 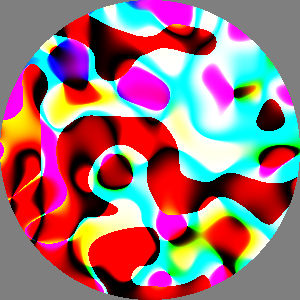 For the purposes of this 2d texture synthesis library, I use only the z=0 slice through the solid texture. I started with the reference implementation from Ken's 2002 paper Improving Noise and later took out the computation for the unused z dimension. Ken writes in his papers that Noise is equivalent to white noise that has been smoothed with a Gaussian low pass filter. That is almost exactly what is shown in the first image of April 12. 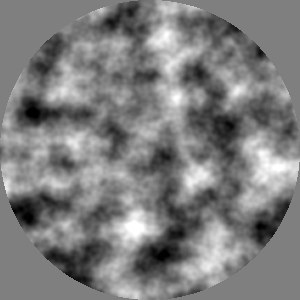 One difference is that this image is pure gray scale since Noise is a scalar value. The April 12 image is gently colored because it began from the color confetti of Grain texture. After working to eliminate unwanted stretch from the Array operator, I now restore balance by introducing a Stretch operator. It basically scales an input texture in the x direction while leaving y unchanged. In addition to that scale factor it also includes parameters for rotation and translation. 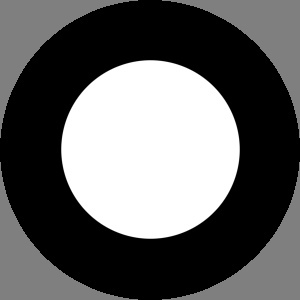 The black ellipse is a Stretch (by 0.5) of the white circle. With no rotation or translation, scaling is applied along the horizontal. 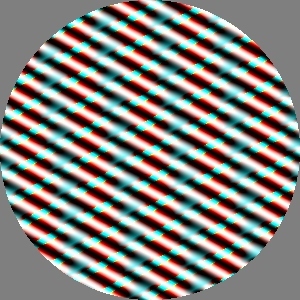 The red dot shows the center of the transform. The blue line indicates the angle parameter and corresponds to the fixed points of the transform. 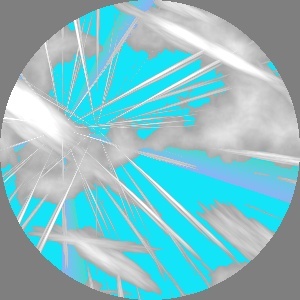 This image shows the artifacts caused by using the (non-supersampled) cache in the presence of rotation. Round-off errors in pixel coordinates cause small positioning errors that add high frequency “fuzz” in the image. Without a radically different scheme, caching is just not working out. I will leave it turned off until performance issues require a different implementation. I will leave it in place for Blur and related operators that need to access each pixel of the input texture multiple times (and do not involve rotation). As noted for April 21's third image, the skew Array produced from non-perpendicular basis vectors was nice looking but “wrong”. The image to the left is the corrected version of Array applied to the same parameters. The input texture is no longer stretched and all cells are rigid translations of the original input texture, as seen in the center cell. These two basis vectors have the same length so each cell is a rhombus. This fix involved an excursion into non-orthogonal coordinate systems, where projecting a point onto an axis cannot use a dot product's perpendicular projection (as in the previous buggy version). I implemented the required skew projection using a line intersection calculation for lines defined in terms of a point and a tangent vector. 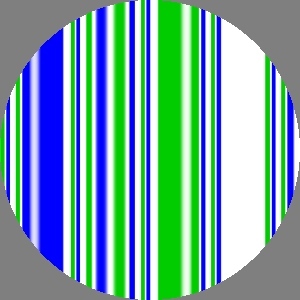 Another oblique Array using April 23's input texture (plus a horizontal blue bar), showing that the input remains unrotated. In this image the Array basis vectors have none of the “special properties”: not aligned with the global axes, not mutually perpendicular, nor of equal length. As a result the cells shown here are parallelograms. For randomly selected basis vectors, as in the context of evolutionary computation, this would be the typical case. As mentioned in the previous entry, the existing Row operator was broken. It only worked for a horizontal basis vector, and made things easy on itself by ignoring the y component. For the source image to the left, the old Row operator would produce a series of copies of it translated to the left and right with horizontal spacing equal to the x component of the basis vector. This is a “near miss” -- not quite the right thing. (Irony alert: for a library whose goal is as ill-defined as “make pretty pictures” it can be tricky to tell right from wrong.) 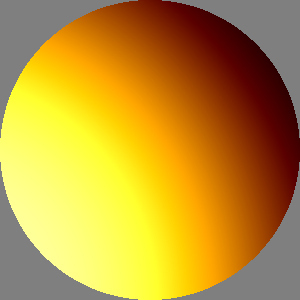 In this version the non-horizontal basis is handled correctly but the source texture is rotated to align with the basis. This violates the idea (see previous entry) that the “center cell” should remain identical to the input (above). This is the “correct” version, at least according to my arbitrary definition. The center cell (a strip running roughly from west-northwest to east-southeast) is identical to the corresponding region in the source texture (top left image). The other four visible cells are rigid translations of the center cell. Note that these images were made with caching turned off. More on that later. The image to the left is an Array whose two basis vectors are perpendicular, equi-length and aligned with the global axes. The source is a scaled and tinted RingedSpot. The basis vectors of this Array are perpendicular and equi-length but rotated, producing a rotated square grid. If the bases had different lengths the grid would be rectangular. This Array has basis vectors of the same length which are not perpendicular, producing this skewed or oblique grid with rhombus shaped cells. This result was visually pleasing enough to seem correct at first, but eventually cold logic convinced me that it was a bug. That conclusion is based on an admittedly arbitrary principle that Row and Array should produce a collection of cells, each of which is a rigid translation of the “center” cell, which should remain identical to the source texture. More on the rigid version of oblique Array later. Still, this operator is too cool not to preserve somehow in the library. If not as its own operator, this effect could be obtained by applying the (not yet implemented) Stretch operator to an Array. Forgive me gentle reader, today's entry is merely about the fun of fiddling with code and accidentally making a beautiful mistake. The image to the left is the same as yesterday's entry except that the intensity (brightness) of a pixel is defined (rather nonsensically) as the minimum of its red, green and blue components. To me this looks a like a 3D shaded rendering of a lot of small pastel colored blobs. My daughter said it looked like Floam. 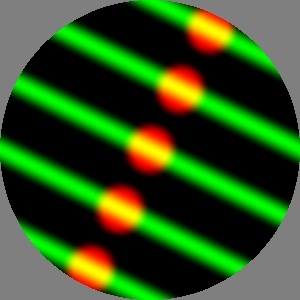 In this image intensity is defined as the maximum of the RGB components. This was the first variant I tried while thinking about yesterday's version and how it might lead to unintended clipping of RGB values. This image was surprisingly different from yesterday's with white threads between blobs of dark desaturated colors. Sensing I was on to something interesting, I then tried the min version above and the distance version below. 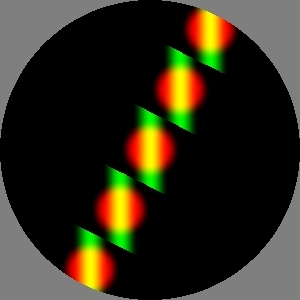 In this image intensity is defined as the distance in 3D RGB space from black to the given color (divided by √3, the distance from black to white). Note that it is very similar to yesterday's image where intensity was defined as the average of red, green and blue values. I think this version is slightly darker than yesterday's because it is less prone to create colors outside the unit RGB cube. The four images from today and yesterday hark back to Karl Sims' evolved textures from 1991 where each pixel was generated by an evolved program whose arguments were the x and y pixel coordinates. That work used a “microscopic” approach while my library is more “macroscopic” where evolved programs process whole images. This is an experimental AutomaticExposure operator applied to fuzzy grain. (Blur applied 8 times to Grain, as in the second image for March 23.) I had been thinking about operators to adjust the “contrast” of textures. For example remapping pixel intensities through an exponential as in gamma correction. Another example would be, as in this case, remapping a small range of intensity values (roughly from 48% to 52%) to the full range dynamic range of the display, from black to white. This AutomaticExposure operator accomplishes that without any parameters by measuring the input texture. It remaps the pixel intensities with the lowest value becoming black and the highest value becoming white. 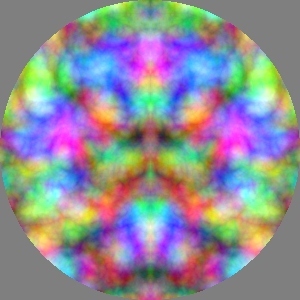 It gets those values from a new capability of CachedTexture that randomly samples a given circular region of the input texture and estimates the max, min and average pixel values. My to-do list included “additive and subtractive color mixing” harking back to features I implemented in Symbolics S-Paint, my previous foray into 2D graphics. 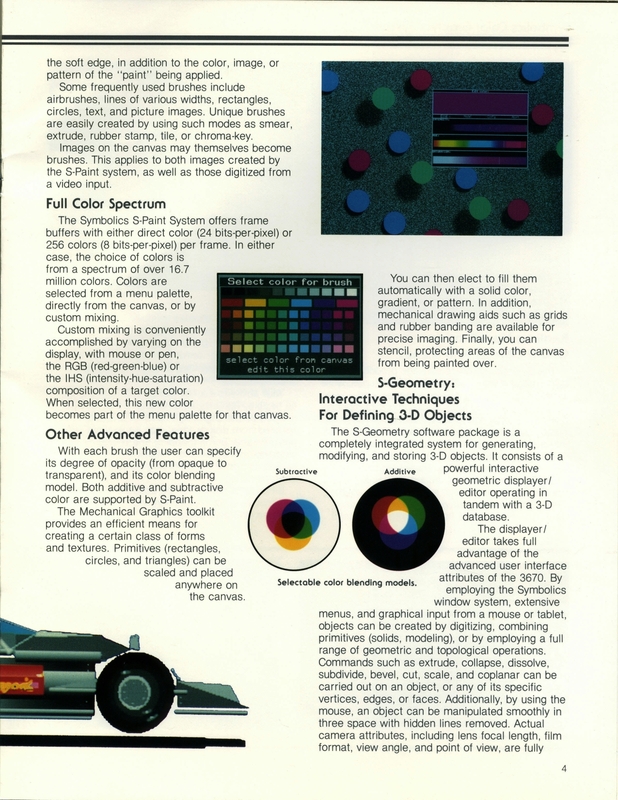 See this page from a 1984 brochure showing images like those to the left created in S-Paint (more here). High end paint systems back then used soft mattes (alpha blending) to combine opaque colors, but at that time additive and subtractive color mixing was probably unique to S-Paint. I think my SGD coworker Eric Weaver microcoded these operations in firmware allowing them to run at interactive speeds. 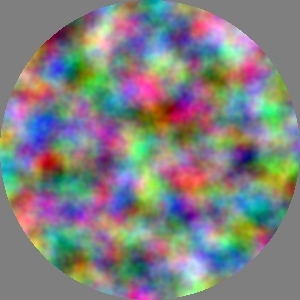 After a little thought I realized that additive and subtractive color mixing could be obtained using operators already in this texture synthesis library. In fact the images in the entry for December 26 show the additive mixing of three gratings tinted in primary colors. The top image can be thought of as a white wall in a dark room illuminated by three overlapping spotlights, each tinted with a colored “gel” in red, green and blue. 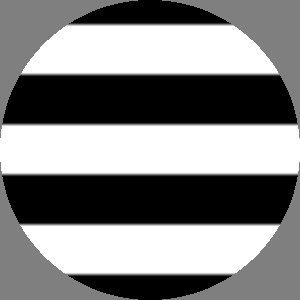 Secondary colors are produced where two primaries overlap, white is produced where all three overlap in the center. 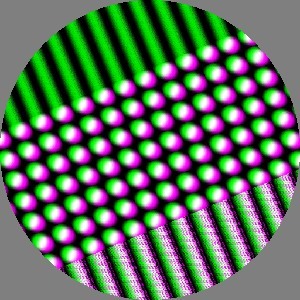 This image can be thought of as a white field (like a light box) on which three gels colored cyan, magenta and yellow have been overlaid. (Or a white sheet of paper tinted with three overlapping dots of colored printer ink.) 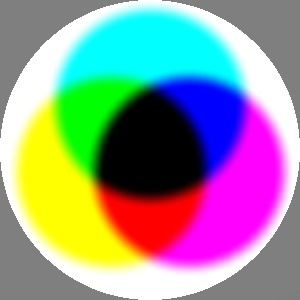 Primary colors are produced where two secondaries overlap, black is produced where all three overlap in the center. 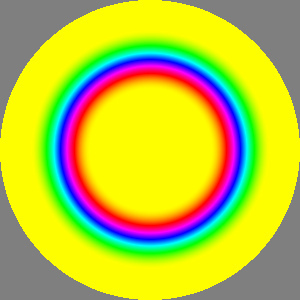 For example, yellow subtracts (blocks) blue light from the white background, magenta subtracts green, so the overlap of yellow and magenta filters produce red. The subtractive effect is obtained by multiplying together fractional RGB color components which typically range between 0 and 1. This is not a physically correct model, but is good enough to produce this visual effect. In the first image three primary color spots on black backgrounds are added together. In the second image the spots are inverted to make secondary color spots on white backgrounds and these are multiplied together. It is interesting that the sum of the spots is equal to the inverse of the product of the inverse spots. If I was more mathematically inclined I could probably come up with a more specific word for this than “interesting”. There is a cliché used in TV comedy to set up a flashback: a character says “I remember it like it was yesterday...” followed by a wavy line video effect and perhaps a harp flourish. In honor of the cheesy video effect, the image to the left is a SineShear operator applied to vertical lines. 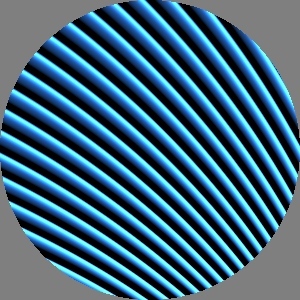 In this simple version, the texture is shifted horizontally by a sine wave parameterized by amplitude, frequency and vertical position. SineShear applied to another vertical stripe pattern, this time with an offset center and an angle. I'm not sure if a translation parameter makes more sense than a scalar phase parameter. The two seem roughly equivalent. Today we have two new operators inspired by spirals, twists and peppermint candy. 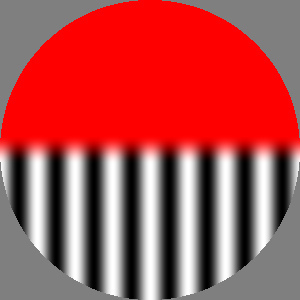 The image to the left shows the VortexSpot operator applied to a pattern of alternating red and white radial stripes (shown in the third image). 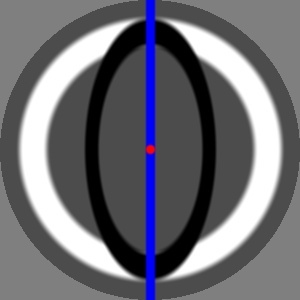 This is a local operator whose parameters include a center point and a radius (in this case, the origin and 0.4). 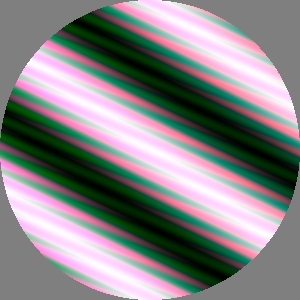 Outside that circle the input texture is unchanged. Inside a rotation accelerates towards the center. Currently there is a parameter to control the total amount of rotation, while the exponent controlling the rate of increase is fixed (at 3). The exponent could be exposed as a parameter but only a small range of values produce a visually interesting effect, so maybe not? 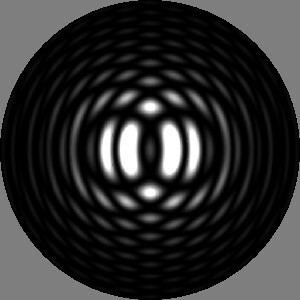 This related Twist operator has infinite extent, applying a rotation proportional to the distance of each pixel from a given center. An “angular scale” parameter adjusts the ratio of distance to rotation. This is the input texture used in the previous two examples. 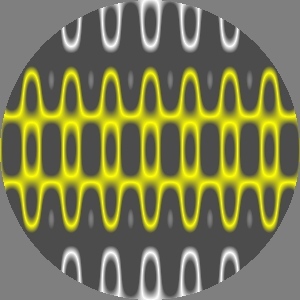 It is a Wrap applied to the new “slightly soft-edged square wave grating” generator with the oxymoronic name SoftEdgedSquareWaveGrating. Compare this to the “radial grad” in the December 10 entry. 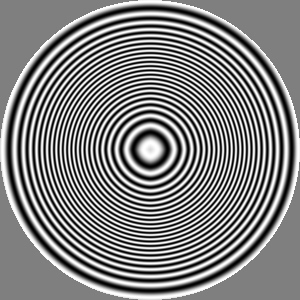 In that, the intensity profile along a circle is a sine wave. The profile here is generally like a square wave (as in SquareWaveGrating) but with “narrow” sinusoids at the transitions between 0 and 1. So if you are keeping score at home, this would be the fifth “waveform” for gratings defined in this library. Since the soft transition width is a parameter SoftEdgedSquareWaveGrating is actually a continuum of waveforms between the extremes of SineGrating and SquareWaveGrating. Maybe these three waveforms can be folded together in some future revision. This simple generator brings up some issues of API design that so far have been unresolved -- or rather have been resolved inconsistently. Should the API design goal be to minimize the number of parameters for simplicity or should all potentially useful parameters be included for generality? For example, the SoftEdgeSpot generator does not currently have a “center” parameter to specify translation. The assumption was that the Translate operator provides that functionality, so why complicate SoftEdgeSpot with an extra parameter? Modularity, orthogonality and simplicity all argue against it. On the other hand, this library is designed for use by GP (an automatic programming technique inspired by evolution) which changes some design criteria. For example, unless a SoftEdgeSpot happens to appear within the scope of a Translate operator it will always be located right at the center of the final texture. Adding a center parameter to the SoftEdgeSpot generator effectively forces GP to pick a location for the spot. I think this will generally lead to less regularity and more interesting, complex textures being evolved by GP. So what would a more elaborate, GP-friendly Gradation generator look like? Perhaps it would be like the one described above, with a parameter for transition width, plus parameters for rotation and translation. Or perhaps it could fold together translation, rotation AND colorization by specifying two positions and two colors. Two endpoints define a line segment indicating the orientation and width of the transition. 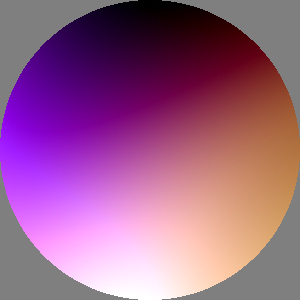 Two colors correspond to the value of the gradient at each endpoint. 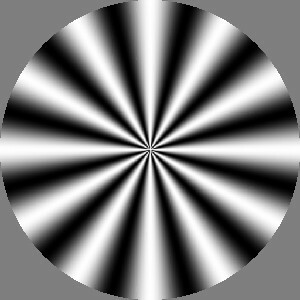 In the first image above, the two points would be on the X axis and equidistant from the Y axis, the colors would be black and white. These three candidate parameterizations of the Gradation generator are illustrated in the code box below. Each produce the same tilted, offset, yellow-red grad shown to the left. The key point to notice is that the “minimalist” version 1 turns out to require the largest amount of code while the more “elaborate” version 3 is the most compact expression. Version 1 is not just larger, but it seems more “genetically fragile” since the three helper operators must all appear together lest the grad be centered or vertical or monochrome. For now Gradation is defined as in version 3. I think I am leaning toward adding a “center” parameter to SoftEdgeSpot but am conflicted about whether to add two color parameters. Possibly I could do both with multiple constructors for the generator classes. Riffing on the HueOnly version of blurry grain, I tried applying HardThreshold to the same input and got a nice texture that reminded me of an old-fashioned composition book cover. The December 13 poppy seed texture used a similar idea. Annoyingly I noticed that HardThreshold produced a texture that appeared to have some gray values in it. That was good news and bad news. Soft “filtered” edges are generally a good thing but that operator should have produced only black or white pixels. That lead to the OpenGL texture filtering fix discussed in the previous entry. Once I got a bug-free version of hard-edged thresholding working, I wrote a new soft-edged thresholding operator that takes two floating point values to delimit the start and end of the soft transition zone. I fixed a bug in my display code which had caused occasional localized blurring. This happened when OpenGL tried to “help” me by filtering my textures for use in 3D. I am still using OpenGL, certainly overkill for this application, but have convinced it not to do any filtering. This texture is a hard-edged resolution test chart. Along the center row pixels alternate between black and white. The wavelength of this square-wave doubles (decreases one octave) in each adjacent row. This is a blurry grain texture (see second image) from which the pure hue component has been extracted with the new HueOnly operator. 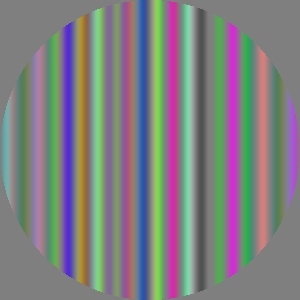 It takes a pixel value in RGB space, converts it to HSV, then throws away the original saturation and value, replacing each with the max value. So the result is composed of fully saturated, fully bright hues of the original image. 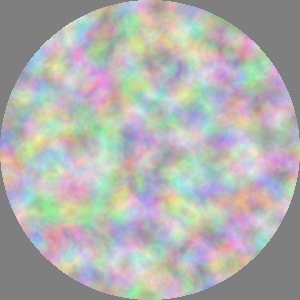 This is a Grain texture to which Blur has been applied 8 times. That is similar to a low pass filter (Gaussian-ish) whose kernel is 17 pixels in diameter. 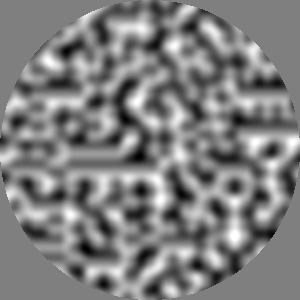 The first Blur is 3x3, subsequent convolutions extend the support radius by 1 pixel (17 = 3+2×7). Yikes! The March 19 band-aid fix to the cache-miss problem caused an exponential explosion doing a series of nested Blur operators. Apparently the 3x3 LPF kernel's support fell outside the cache in a one pixel wide border around it. 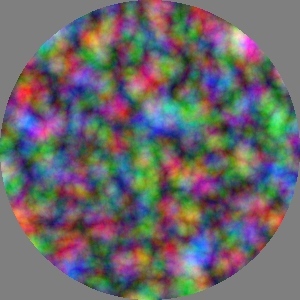 The iterated Blur operators caused an exponential growth of uncached pixels in a region 8 pixels wide all being recomputed many times. I think each such miss would cause 8 more accesses to the input texture, so perhaps 87 (2 million!) additional getPixel calls? 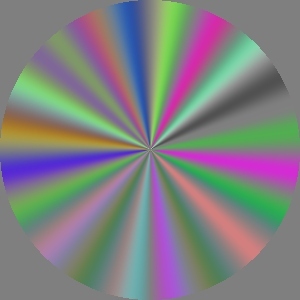 This image is just to test new routines to transform color values between the RGB and HSV color spaces. 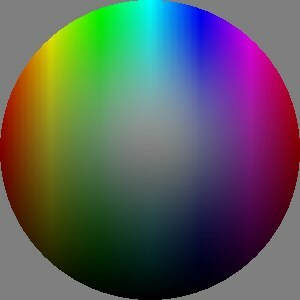 RGB (red, green, blue) is the color space used by most display hardware and HSV (hue, saturation, value) is a “computer graphics friendly” version of IHS (intensity, hue, saturation) space that corresponds more closely to human color perception. The HSV and HSL spaces were first described in the literature by Alvy Ray Smith in 1978. 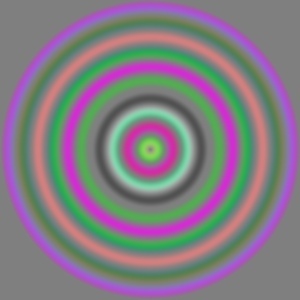 In this image, hue varies from left to right, value (intensity) increases from bottom to top and saturation increases radially from the center. I added a Ring operator similar to both Row and Wrap. Like Row it replicates a rigid portion of the input multiple times into the output. Like Wrap these copies are pie-shaped sectors rotated around a given point. 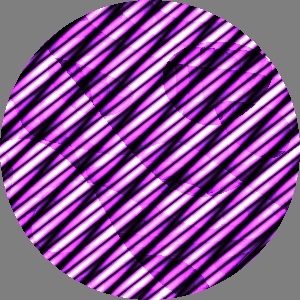 Compare this image made with Ring to the February 6 image of Wrap applied to the same texture (purpleRSpot). Historical note: my ASAS procedural animation and modeling system included analogous ring and row operators back in 1978. 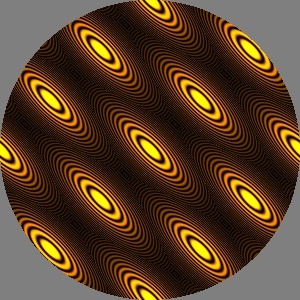 This fractal pattern was made with Ring and a SoftEdgeSpot. 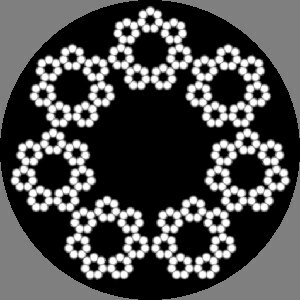 There are three levels of recursion, each ring has seven copies, for a total of 343 spots. This image demonstrates a band-aid fix for the “cache miss” bug. The CachedTexture object simply passes through the original texture if outside the cached region. While testing the new Ring operator, I discovered a bug in the caching mechanism. Here is the “standard benchmark” (see entry for November 26) scaled down by half. Oops! The current cache implementation assumes a finite region of interest. The size is not adaptive so sometimes its too big and sometimes too small. Worse, “cache misses” are handled ineptly, as shown in this image. Finally the spatial resolution of the cache is fixed which can lead to loss of image quality. Recently I added input caching to the Wrap operator. I noticed that for a simple case (February 6, bottom image) the caching code was actually 15% slower which begged the question: why use it? However metering Ring with a somewhat more complicated texture (test4dots) showed a 60% speedup. Presumably the speed-up would be significant for the sort of complex textures that this library is intended to provide. Caching remains a requirement so a new implementation is required. Finally fixed the problem seen in the January 4 entry: the “local non-linear radial scale” operator correctly handled expansion but not contraction. The new version of the operator uses a look-up table to invert the scale-as-a-function-of-radius curve. I renamed the operator from RadialMagnification to StretchSpot. 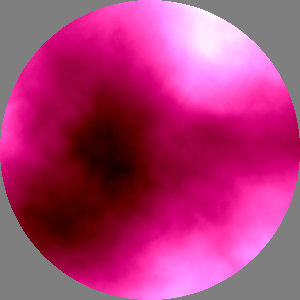 as well as adding a “center” parameter and removing the “inner radius” parameter. (The first draft had parameters like SoftEdgedSpot.) Compare this image to the “local fisheye expansion” in the January 1 image. 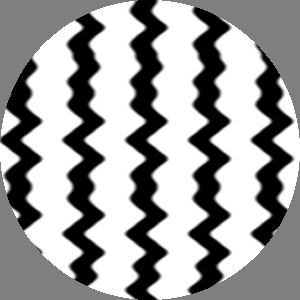 Here the same background pattern is first contracted about a point near the top and then expanded about a point near the bottom. The two circular regions of stretch just touch at the center. I tried adding an angular scale parameter to the previous version. It maps from horizontal coordinate in the source image to angular coordinate in the polar wrapped output. The results are more what I had in mind but I worry about adding too many parameters that might be troublesome to set. Here is the same five-fold Wrap applied to a SoftEdgeSpot and a tinted RingedSpot. A first pass at a Wrap operator that takes a rectangular region of its input and wraps it in pie-shaped sectors around a given point. This shows three bar-like textures tinted with primary colors and added together. These bars are extruded versions of spots described below. The two vertical elements are made with the SoftEdgeBar generator which has parameters like SoftEdgeSpot plus position and angle. The blue one has a wide stripe of full brightness with soft edges. The green one (seen here as cyan) has a cosine brightness profile. The horizontal red texture was generated with RingingBar an extruded version of RingedSpot. The local expansion worked well and so it was disappointing that inverting that one parameter did not produce the inverse fisheye I was expecting. After a little investigation I realized I needed the inverse function of the radius remapping used in the previous example. That has so far eluded my limited algebraic skills. If nothing else I will have to use a lookup table, or a spline, to approximate the inverse function. This RadialMagnification[?] operator scales the input texture at a given point, with the effect smoothly tapering off to a given radius. 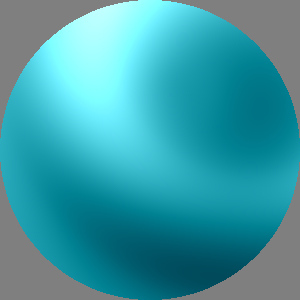 Outside that radius the texture is unchanged. 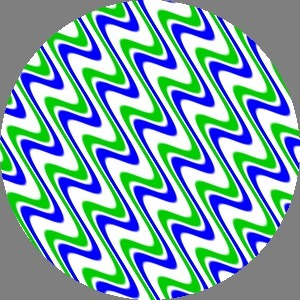 BTW, I see a fairly strong illusory motion in this pattern where the center of the image seems to wobble relative to its background in response to my head movement. 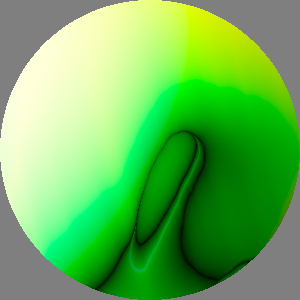 This was an early attempt at a localized contraction warping of a texture. It was not what I was looking for but I thought it was cool nonetheless. The input texture was a linear grating of wide yellow and narrower blue stripes. Note also the aliasing errors near the center. So far all sampling is based on single point samples. Using multiple jittered samples per texel would help in this case, using them all the time might be overkill. A simple criteria for deciding when to supersample would be helpful. 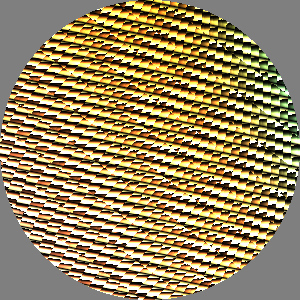 This texture is the sum of three grating-like generators each tinted a primary color. I am unsure what to call them. The red horizontal stripes are a sinusoid linear grating. 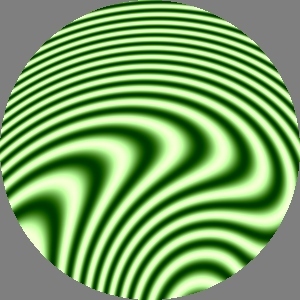 The green target-like rings are an annular grating where the sinusoid is applied to the radius of a pixel (its distance from the center), a slight variation on the RingedSpot mentioned below. The blue pie-shaped sectors result from applying the sinusoid to the angle formed by a pixel, the center and a reference direction. Is that an angular grating, or do the ray-like features suggest it should be called a radial grating? This is the only image here intended to be representational. It is meant to look like poppy seeds scattered on a white plate. I was thinking about the types of images that could be generated with this library, perhaps more worrying about which kinds could not. While cleaning up after breakfast I found myself looking at the real version of this and wondering if it could be portrayed using this library. This attempt is moderately successful. I used blurring and thresholding to get the effect of the morphological image operator called dilation. Perhaps some of the basic morphological operators should be added to this library? Thinking about other basic geometries I want the library to support, some sort of “radial” or “spoke-like” pattern seemed important. 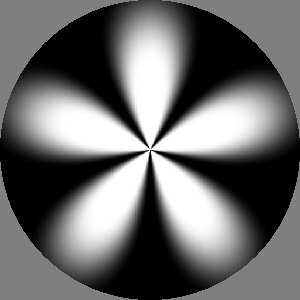 For each pixel in this image an angle is determined from the center. The angle is passed through a sinusoid curve to determine brightness. Since the brightness varies with angle, that suggests the name “angular”. Along any ray/radius the brightness is constant. 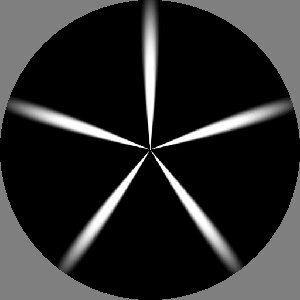 The bright “rays” suggest the term “radial.” I called it RadialGrad for now. 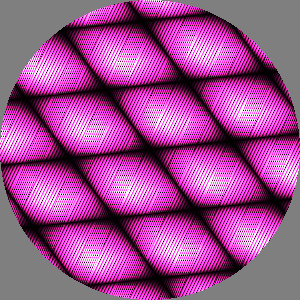 Always on the lookout for complexity on the cheap, I tried to make something like an interference pattern. I multiplied two shifted copies of yesterday's RingedSpot. Indeed the resulting shapes were nice but the image was very dark. 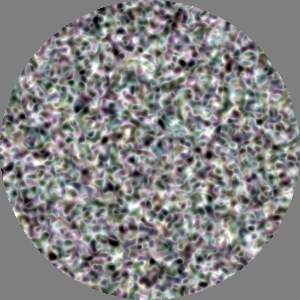 This image is the result of scaling up the brightness of the product of spots. That description sounds simple enough but required several changes in the API to allow color values outside the unit RGB cube, and to clip rather than wrap around at the final 8 bit conversions. Color values are now allowed to get large and are clipped just before display. 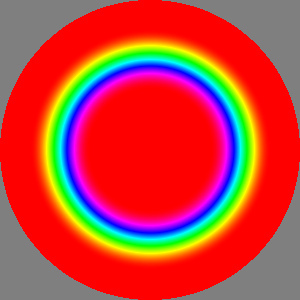 Super-bright colors are harmless as intermediate values but will be lost if they persist to the output. The four largest blobs in this image have been clipped to white and so lack detail at their centers. 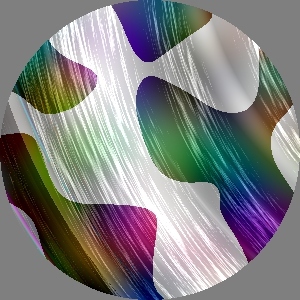 Thinking about generators like SoftEdgeSpot, a round pattern based on a sinc function came to mind. I liked this variation I called RingedSpot where both the amplitude and the wavelength of the rings decrease with distance. This implementation seems a bit ad hoc since there are two hidden parameters related to frequency and falloff. Maybe they should be exposed? 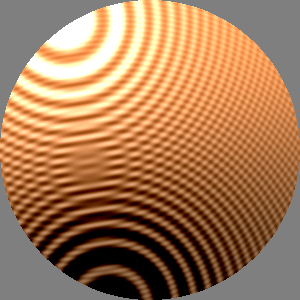 And of course beyond SoftEdgeSpot and RingedSpot there are plenty of other interesting functions that could define the profile of a radially symmetric texture. In the original to-do list I had both Blur and some kind of “sharpen” or “edge enhance” operator. This result, based on a 3x3 convolution kernel, looks more like an “edge detector.” I'd like an operator that will emphasize edges in the input image but otherwise leave it largely unchanged. 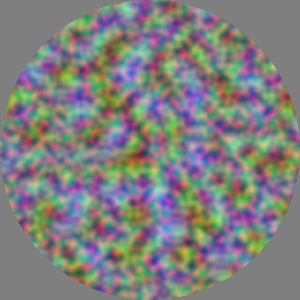 The center of this texture shows the Grain generator where each pixel has a random color chosen from a uniform distribution in the unit RGB color cube. Caching is required for Grain to return consistent results for subsequent getPixel calls with identical arguments. 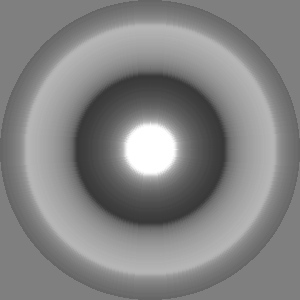 The outside of this texture shows the Monochrome operator applied to the same Grain texture. In between is a soft transition provided by a SoftEdgeSpot. At least to my eyes, the contrast of the result seems similar at the center and the periphery, but seems oddly lower in a ring in the transition zone, roughly 80% of the outer diameter. I have no idea what produces that effect. With the previous texture as a starting point, a Row operator produced a row of copies. Applying Row a second time produced this array. Perhaps there should be a built in “array” operator? 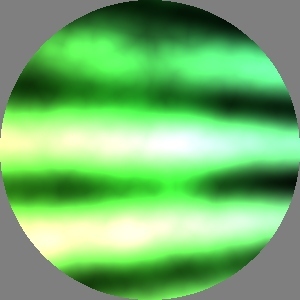 (Update: see April 21, 2009) This texture also allowed experiments with an input caching strategy in operators to prevent recomputing input pixel values when they are referenced multiple times while creating the output texture. 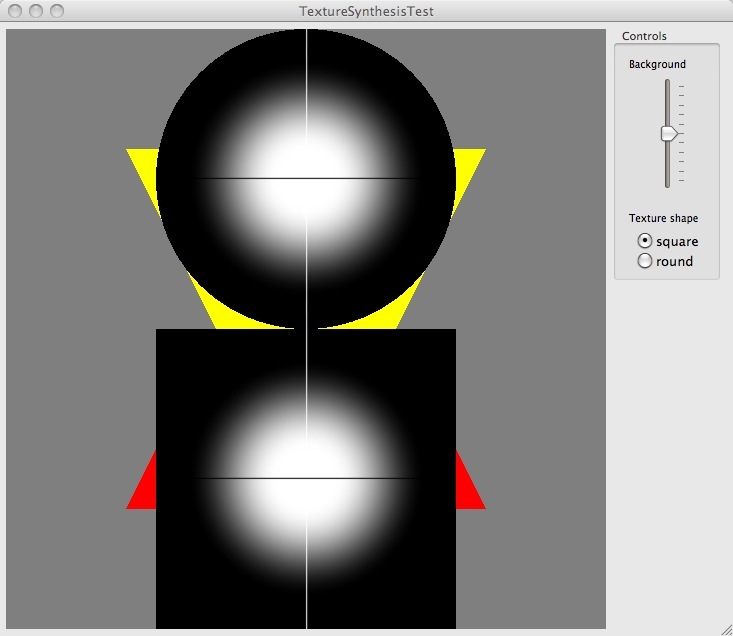 This screen shot shows a simple composition of texture operators. Two soft edged spots are colored and added together. In early November I started learning how to write a simple OSX application using the Cocoa framework. I got one running and displaying texture mapped OpenGL triangles. 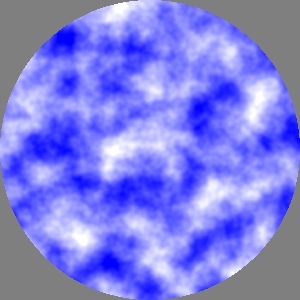 This is the first display of a texture generated via the procedural texture synthesis library described in this document. 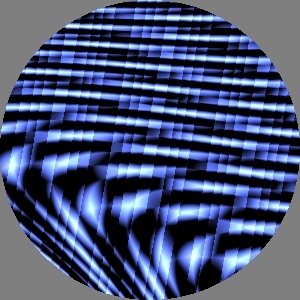 In this case the texture was generated by SoftEdgeSpot. 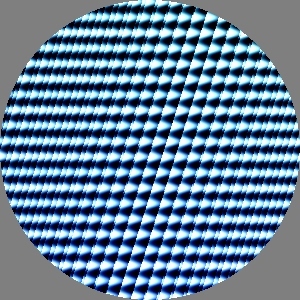 The texture shown applied to both a square and a circle. 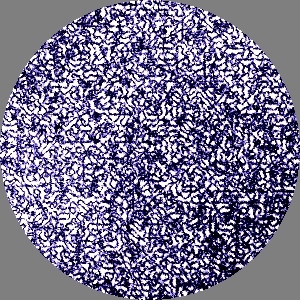 Since I plan to use textured disks in my experiments I stopped using the square format. I used a 50% gray background as the least likely to bias perception of the synthesized textures. By early 2008 I had a vague conceptual design of a library for procedural texture synthesis, suitable for use with a genetic programming (GP) system for automatic program discovery. This combination is intended to allow for goal-oriented texture synthesis. The basic idea was to structure the texture synthesis library as a collection of composable units. It was essentially a data flow model, or seen another way, a collection of functions whose output were color texture objects. 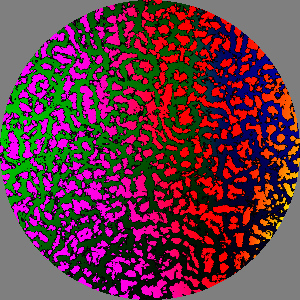 These textures represented a mapping from a continuous 2d plane (ℝ2) to color values. The inputs for these texture producing functions would be parameters like real (floating point) numbers, 2D position vectors, 3D RGB colors and optionally, other textures. Functions with textures as inputs would be called operators and those with no texture inputs would be called generators. I went back and forth about whether the textures should have fixed extent (like a texture map, an array of discrete pixel values) or whether they should have infinite extent (returns a value for any pixel coordinates). 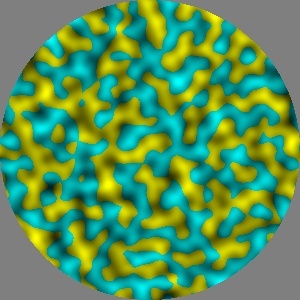 Some potential generators, like reaction diffusion textures, would be expensive to compute so it seemed like caching of texture would be needed. Some operators, for example a low pass filter, would need to access multiple input pixels for each output pixel, so again caching seemed an important feature. I have an email note from April 2008 discussing some ideas about caching strategy. Previously I had assumed the texture functions would cache their outputs (as in memoization) but this note suggested putting the cache on the inputs of operators that needed them. some way to have soft matte? Note that this list failed to mention reaction diffusion textures which I had initially imagined as the primary source of primitive texture in this project. Indeed it was to model natural textures that Turing first proposed such systems in his landmark 1953 paper The Chemical Basis of Morphogenesis [PDF].